On Thursday April 30 2015 I celebrated my 77th birthday. 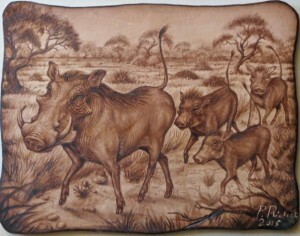 The night before Mary gave me this beautiful picture of a family of warthogs. 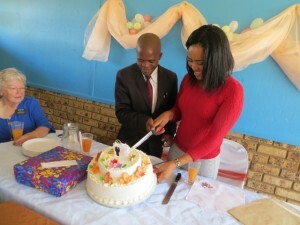 It was done by the son of a couple in our ward who is a very good artist. 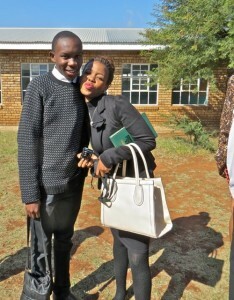 He burns the scene on leather. 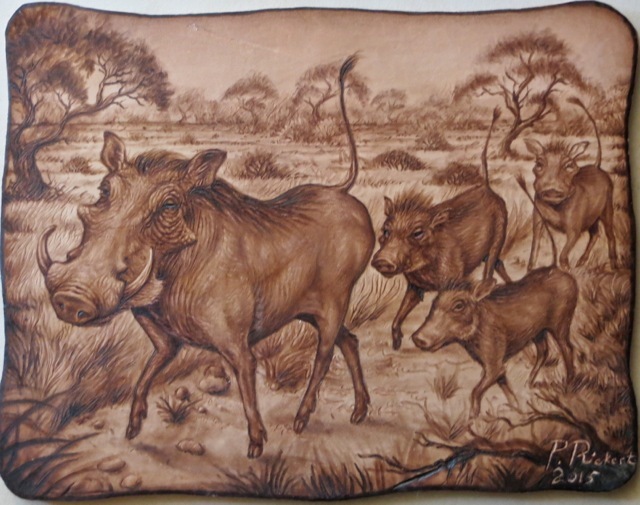 Mary gave him a choice of doing a scene with warthogs, guinea fowl or giraffes – I am glad he picked the warthogs because I have learned love these ugly beasts. 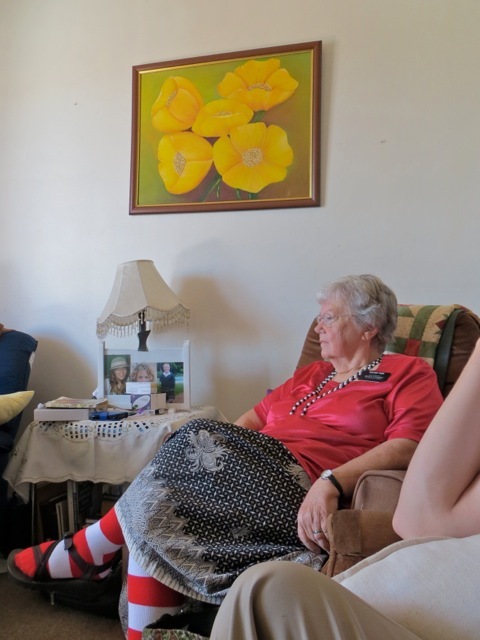 Mary also gave me two pair of warm socks – I will soon need them, a thin tie – elders seem to be wearing them now – and a very warm maroon pullover sweater. 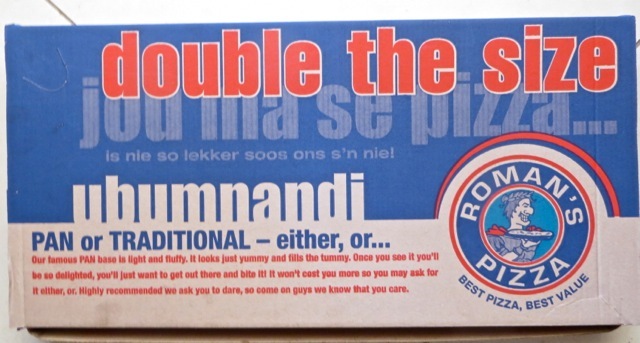 I decided that I wanted pizza for my birthday lunch so we went to Roman’s for the first time in our mission and got two large pizzas – it is the way the sell them. One pepperoni and one Hawaiian. I ate way too much and there was still plenty left over for breakfast, lunch a snack the next day. 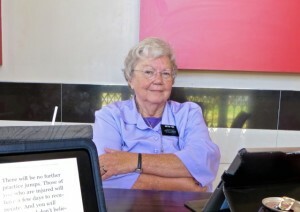 You can see Mary was thrilled that I wanted to take her picture while we at Romans. On one of our trips during the day I noticed this grove of trees that was changing color as Autumn continues to move towards Winter. 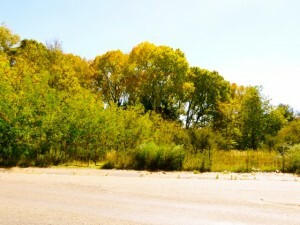 Not as golden as the aspen are during fall in Utah but still very beautiful. 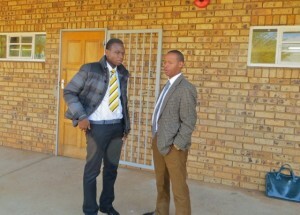 I ended my birthday by us traveling down to Klerksdorp to do the year end audit. Mary came along to keep me company on the drive and she had her iPad for company while I was doing the audit. So started my 78th year on this earth…thanks to a loving Father in Heaven and His Son Jesus Christ it has been a great 77 years and I am sure that there are many more adventures and blessings in the year ahead. 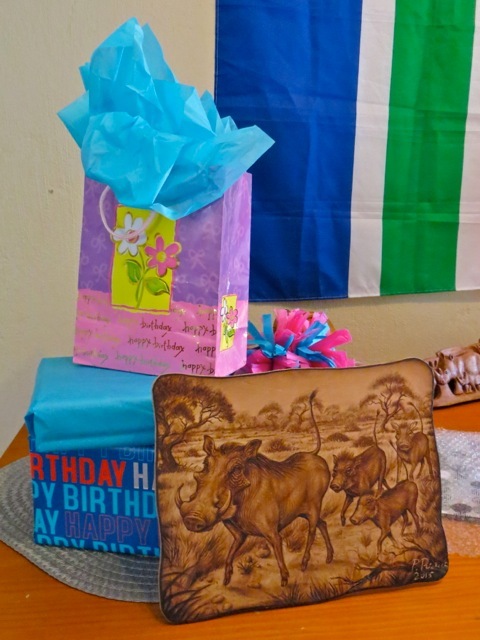 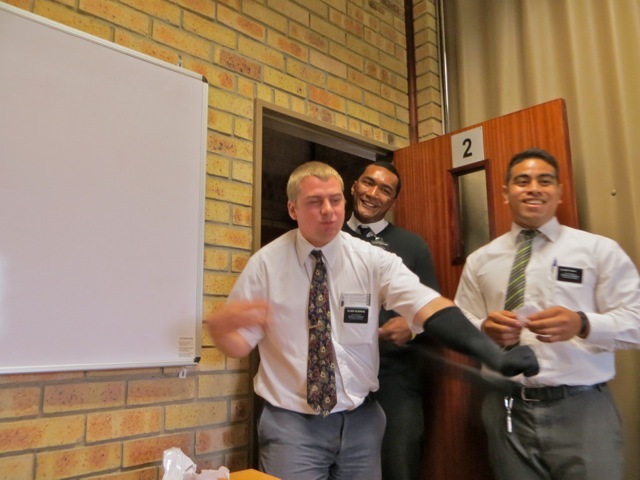 This entry was posted in Johannesburg Mission - Back To Africa on April 30, 2015 by Bill. 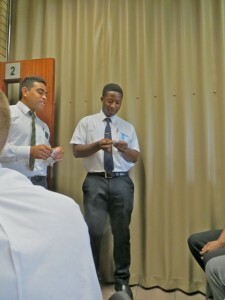 Monday we went to YSA FHE where I taught a lesson on the living prophets and then we played Book of Mormon Bingo. 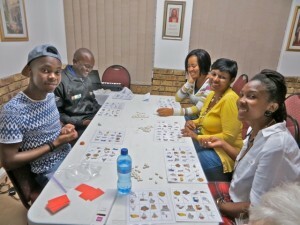 We would have played Go Fish – their favorite – but we could not find the cards. It turned out Papa Thulo knew where they were and found them for me on the following Sunday. 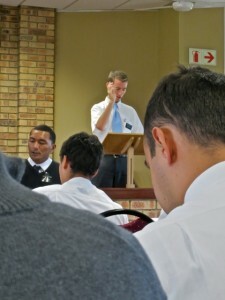 It is too bad that more YSA do not come to the FHE – there used to be 8 to 10 there when we were teaching before. On Tuesday the elder returned our hose that they used to fill the font for Sunday and elder Alvial showed off their dirty car. 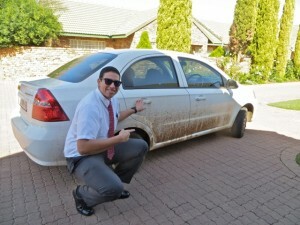 It is impossible to keep the cars clean because of so many dirt roads in the townships. 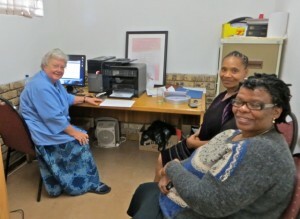 In the evening we went to the office where Mary gave a lesson to sister Lebo. She seems to be doing quite well and is always on time. 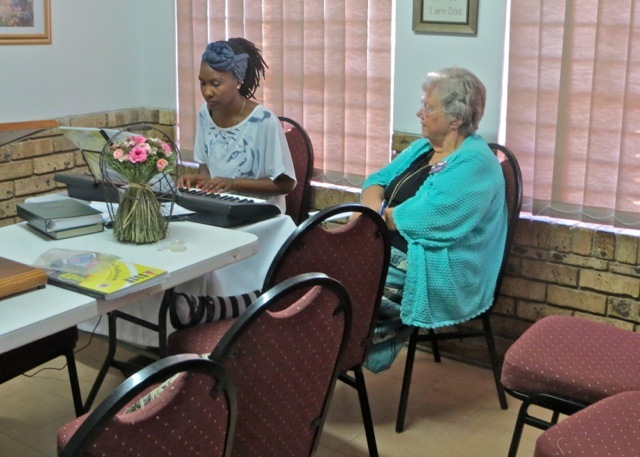 If she practices she just might be ready to play for the branch after we leave. 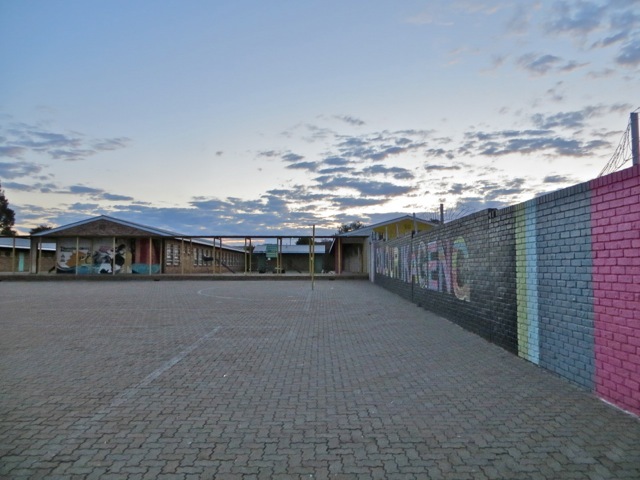 I took a picture of the school yard and the beautiful sky speckled with colorful clouds. It seems to match the colorful murals painted on the walls of the school. 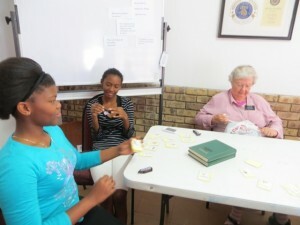 Wednesday we took the elders up to Parys for our monthly visit to sister Bobbi. 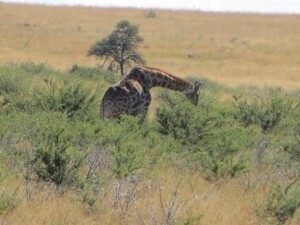 She has not been feeling well at all and so she did not go for her usual walk with us. 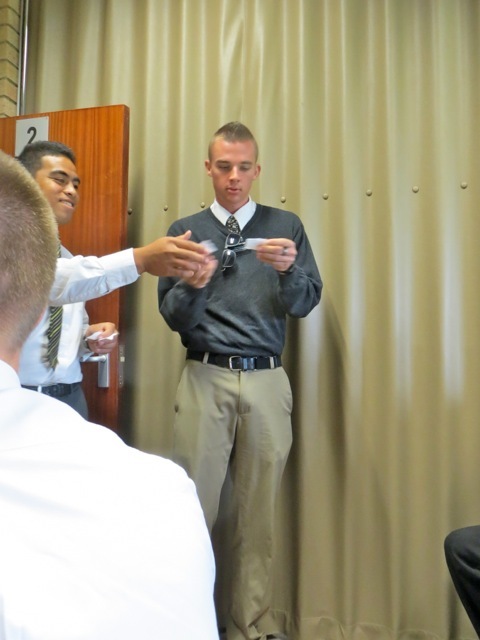 The elders prepared and passed the sacrament. 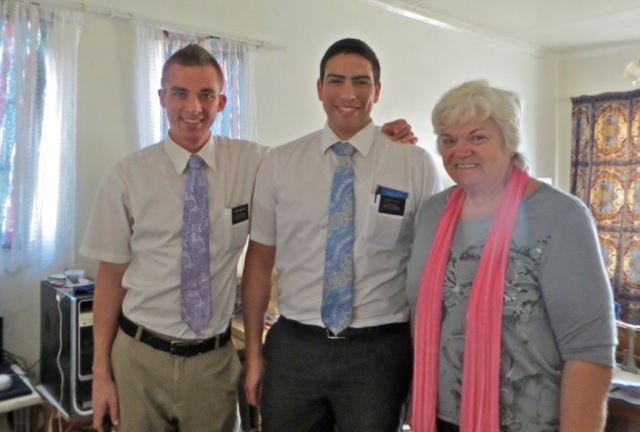 Elder Alvial was in charge of making the traditional cold drink that she offers and we were able to have her almost pose for a picture with the elders. 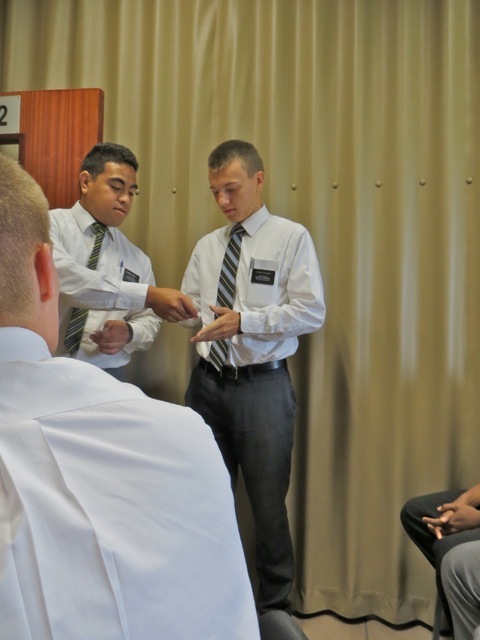 As we started to leave the lock on the door would not work for me or for sister Bobbi but elder Alvial used some love and finally got it open. I had visions of us spending the day locked in her flat. 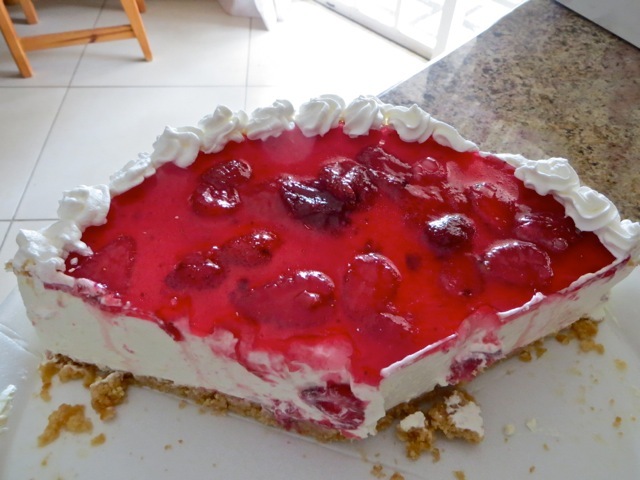 When we were talking the subject of the Cheese cake factory that we pass on our way too and from her flat came up and so I stopped and bought one. 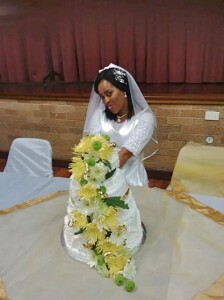 The nice baker not only finished the cake for me but also cut off a section so we could leave some with sister Bobbi. 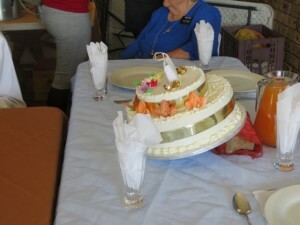 The picture below is our portion after dividing the cake up between sister Bobbi and the elders. It was very good indeed. 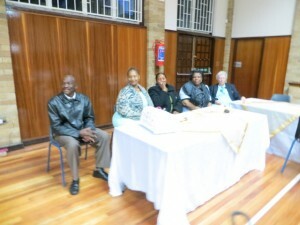 These are two photos from the Friday night reception that I took off of the FaceBook page of another member who was there. I thought they were excellent – especially for showing off the cake that sister Taylor made. 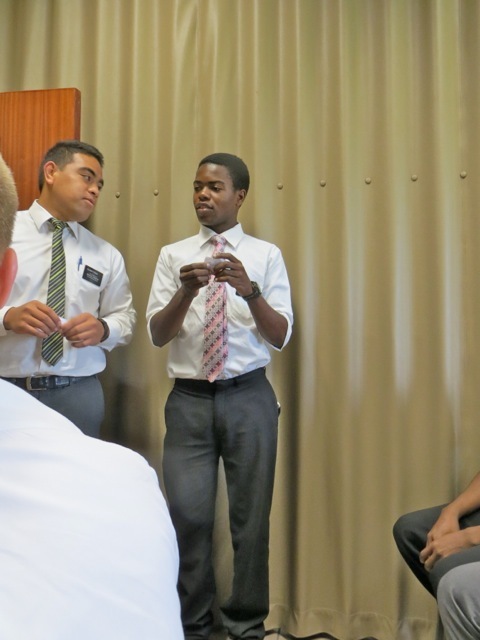 Seminary has been moved to Saturday morning so that more can attend. 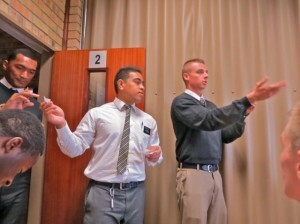 Unfortunately this did not work this first week as all we got was the faithful three. 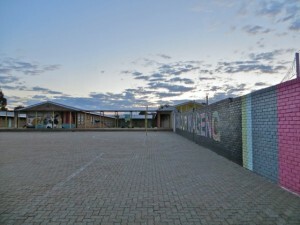 But hopefully in the future it will be better attended. 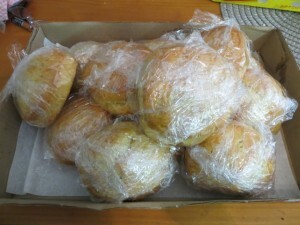 After Seminary on Saturday we stopped at the store and picked up our usual order of 12 delicious large scones. 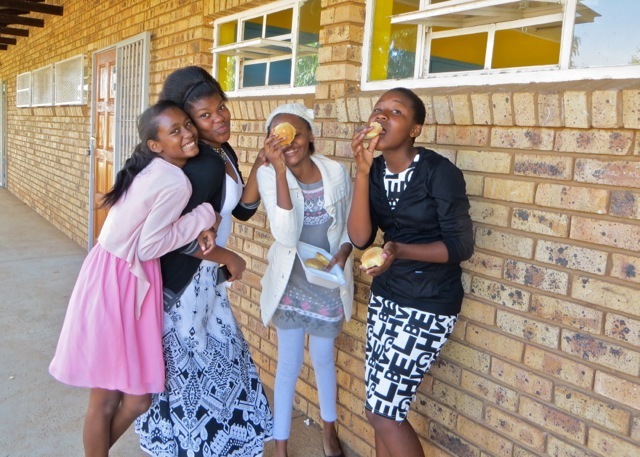 The people in the bakery department all know us by name and I think they make especially large scones to fill our order. 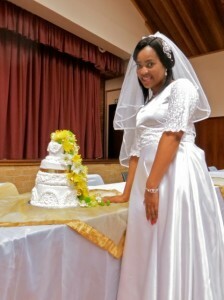 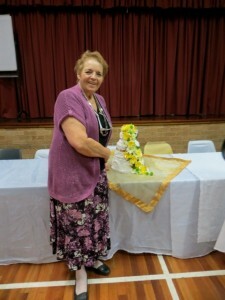 Mary spent the rest of Saturday decorating a large carrot cake for the social on Sunday to honor the Kwaikwais. 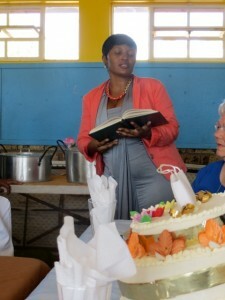 She also made a huge pot of spaghetti sauce to go over the rice that will be served. 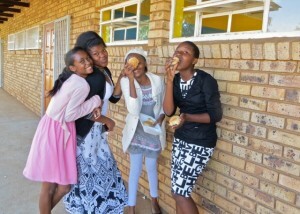 Some of the sisters who had it at the tri-branch youth dance really liked it. I have to say that I liked it better over rice than I do over spaghetti. I take pride in that I grated the carrots for the carrot cake, diced the onions and bell peppers for the sauce – I also stirred the sauce while it was cooking and finally grated blocks of parmesan cheese to put over the sauce when it was served. 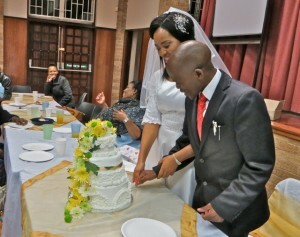 The cake was not only beautiful it was delicious and much more flavorful than the sponge cake that brother Simon decorated for the occasion. I made the map for the area auditor, Denis de Jong who arrived on Sunday to do the very late end of the year audit and then went on to do Jouberton branch. He came in time to enjoy Sacrament with us. We loaned him our GPS so he could get to the Jouberton chapel to do their audit. 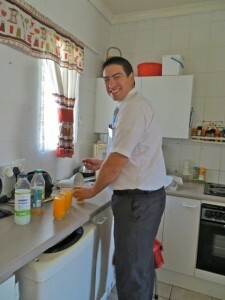 This made it possible for me to stay for the baptism and social. Mary plays for the first hour of Primary. I took this picture of president Kwaikwai with sister Ncapayi in her beautiful African outfit. 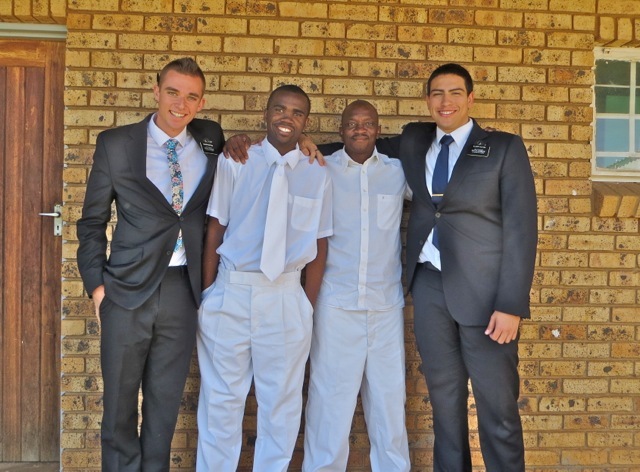 This entry was posted in Johannesburg Mission - Back To Africa on April 27, 2015 by Bill. 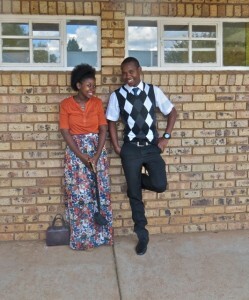 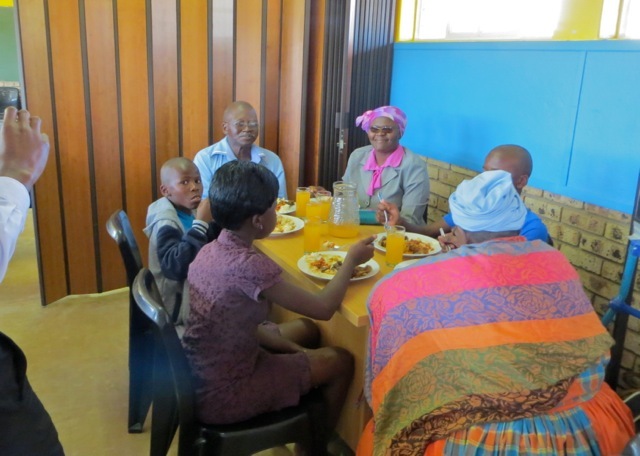 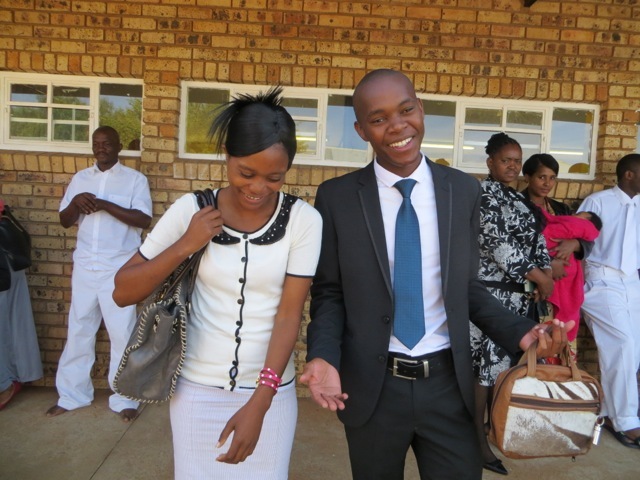 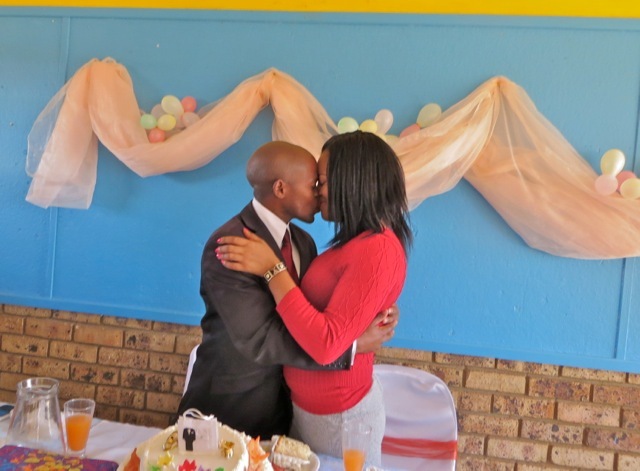 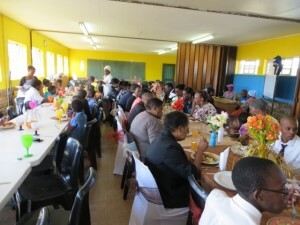 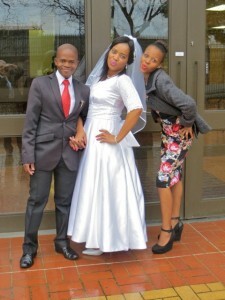 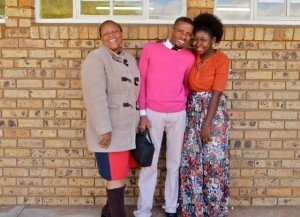 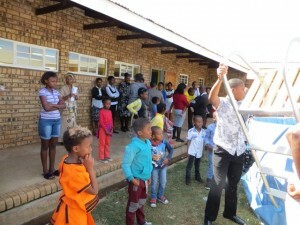 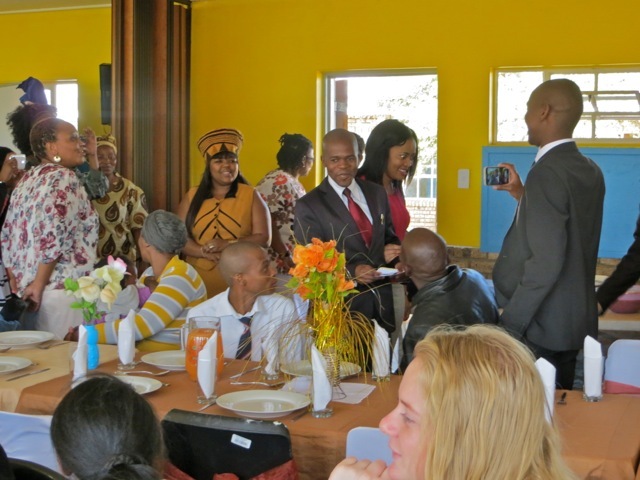 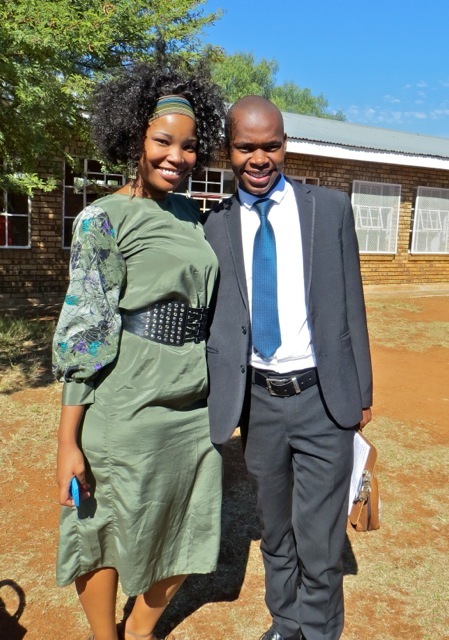 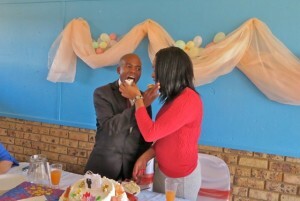 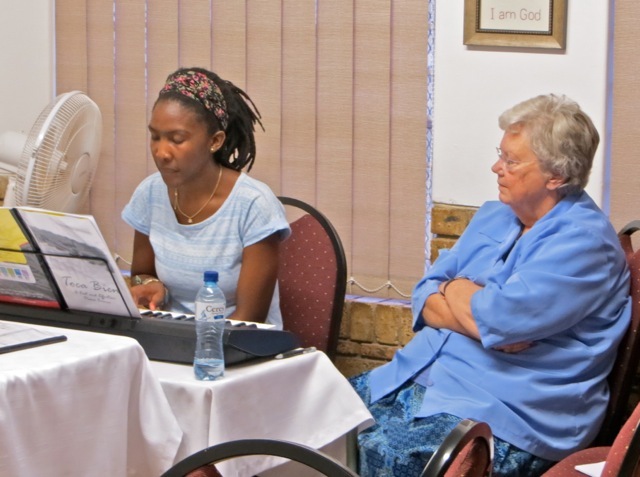 This was a very special Sabbath day here for the Potchefstroom branch. First 72 Saints gathered for the regular block of meetings. 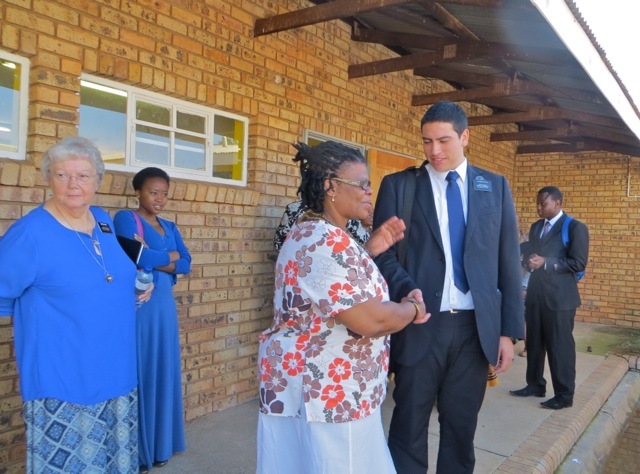 Sacrament meeting was especially memorable because sister Mogapi spoke about how the atonement was personally meaningful to her. 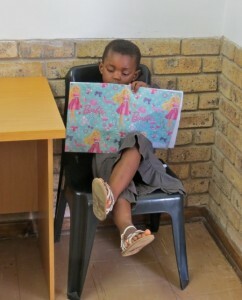 She spoke from her heart and read only a few things from a paper. 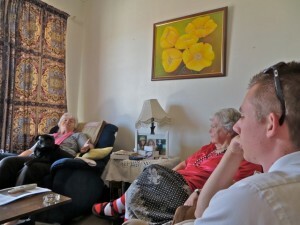 It was a very moving talk. 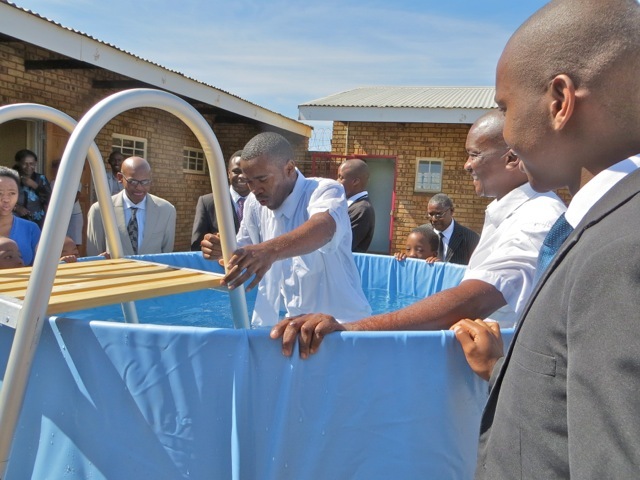 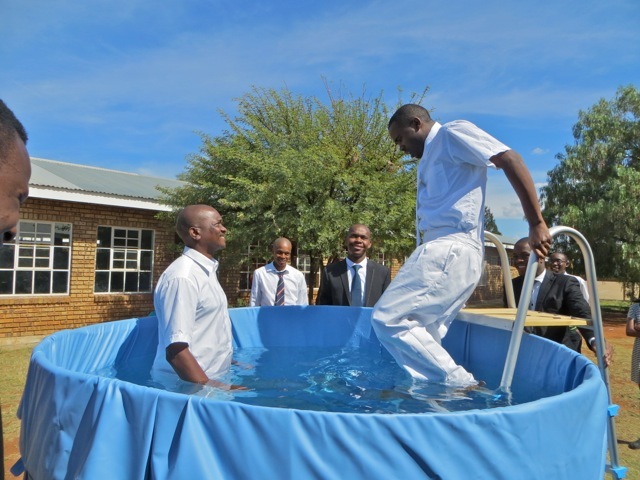 After the block we had a baptism – Gomolemo Tladi Sebokwane which is pronounced – Ho Mo Lay Mo – Clod E – C -Back – Wana – was baptized by David Rampai. 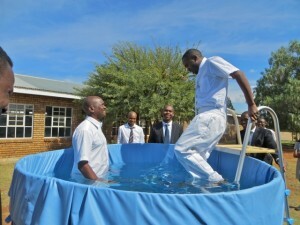 David did an excellent job but had to do it twice as he did not get his head all the way under the first time. His family was present so that was good also. Since next week we will have conference, we had the confirmation after the baptism. 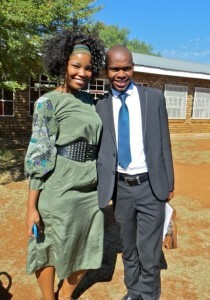 I had the privilege of confirming him a member of the Church. 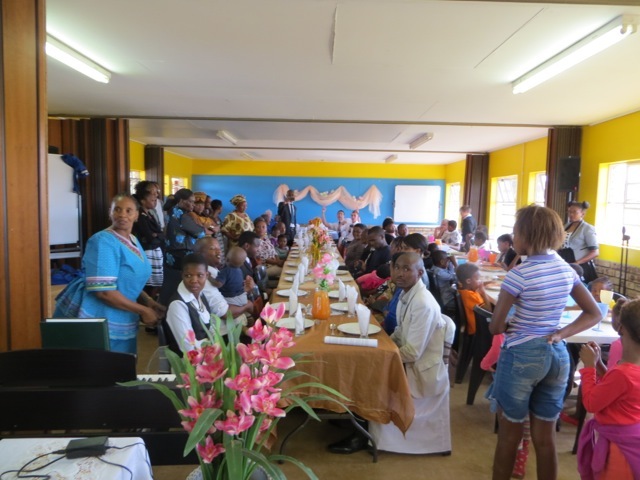 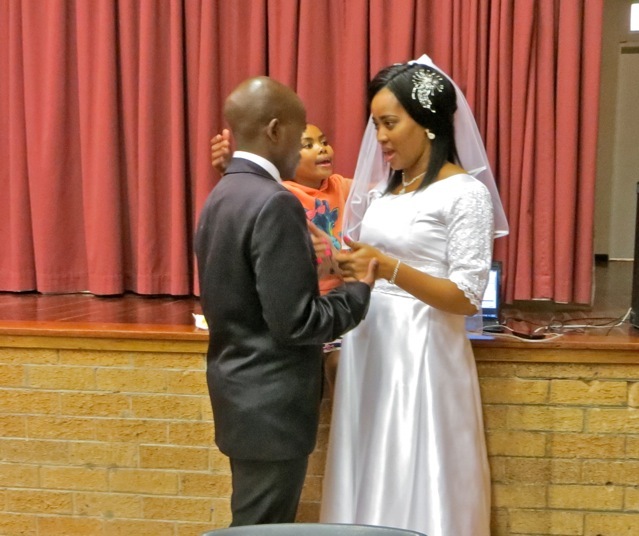 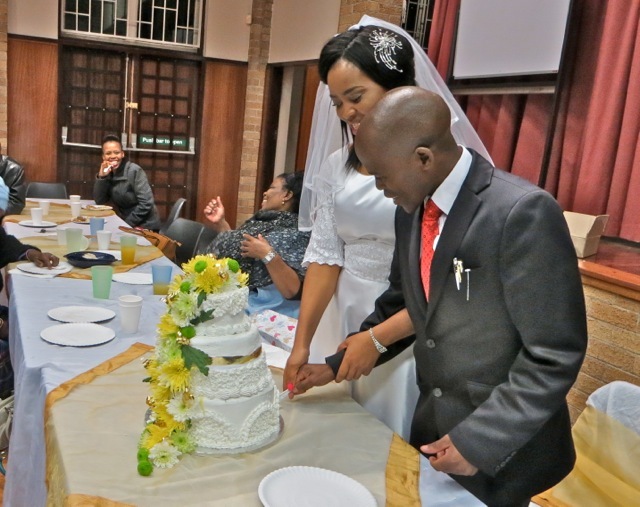 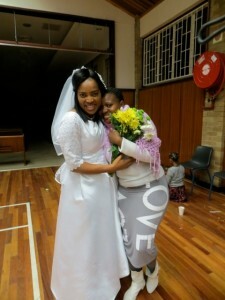 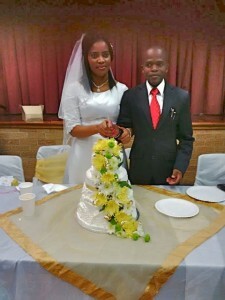 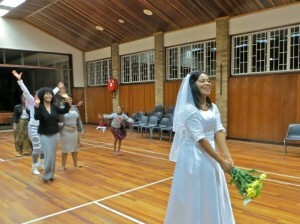 During and after the baptism, the Relief Society sisters and others were busy setting up for a surprise social to celebrate the Kwaikwai’s marriage. 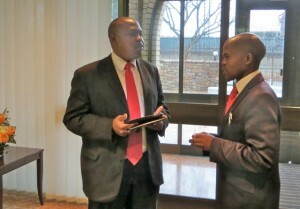 Luckily the president had a number of interviews he needed so he was in his office while the final preparations were being done. They kept telling me that they needed more time so I kept feeding the president interviews – they would say 10 more minutes and I would get them 20 but then they wanted more. 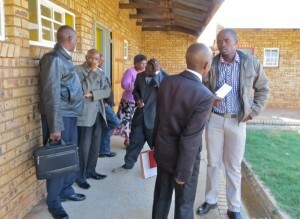 Of course when they were ready, the president got into a long interview and everyone had to wait. I was sure the president knew what was going on but he told me he really did not – he did not plan to have a party until their 1st anniversary. Why I think he may not have known is that when they asked him to speak he got completely tongue-tied and only spoke for a minute or two. He mentioned that this was unusual for him since he loves to talk too much. 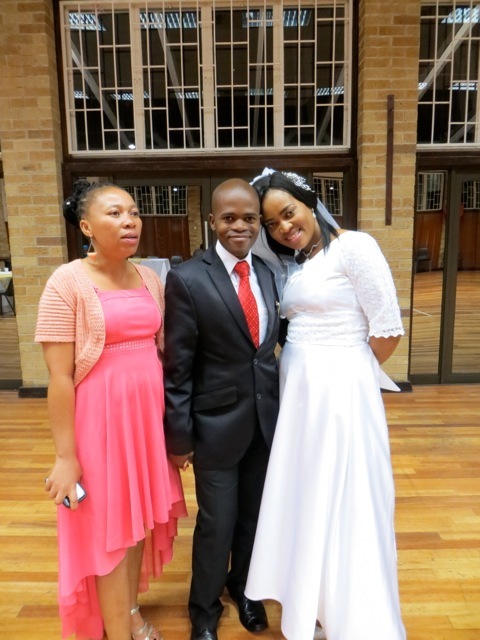 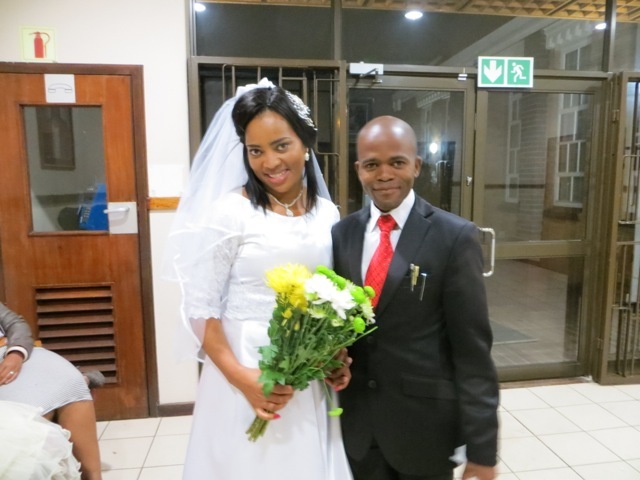 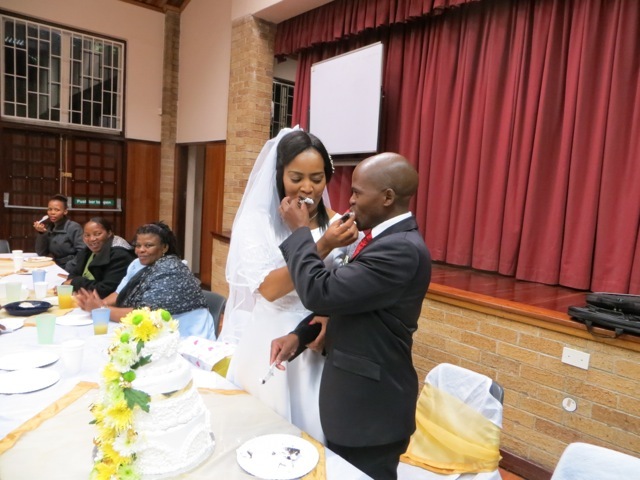 On Friday April 24 we had the opportunity to go to the Johannesburg temple to attend the wedding and sealing of our branch president. 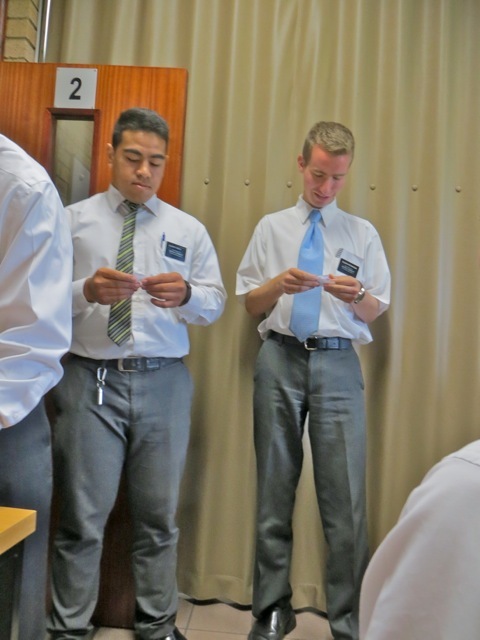 When we arrived at the temple we went to the distribution center and found that a zone of elders who had just gone through the temple. 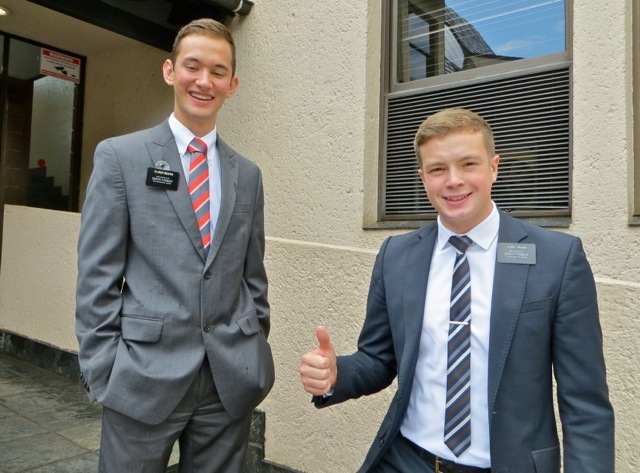 Most zones near the temple get to go once a transfer. 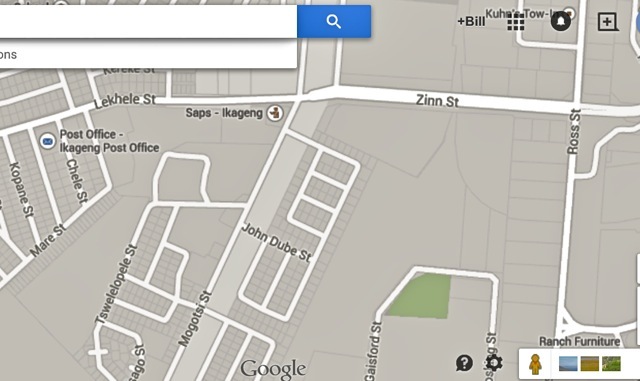 Most of the Vaal Zone goes except for our district which seems to be too far away. 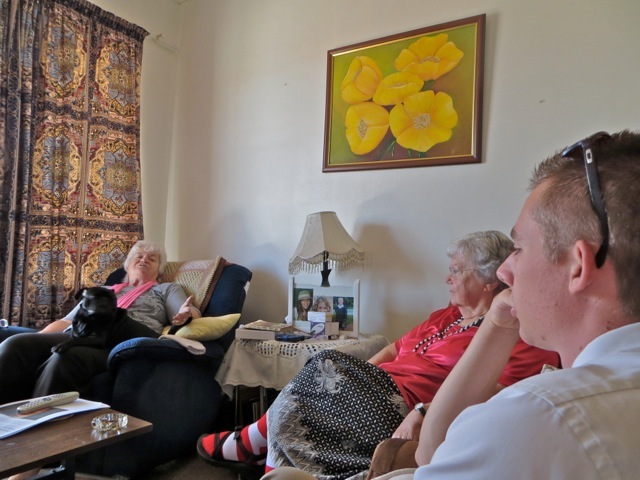 Elders Beer and Stilgoe – thumbs up from elder Stilgoe. 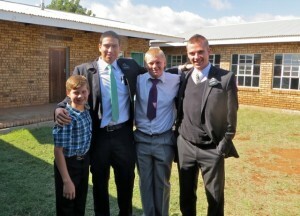 Elders Holmquist and Adjin. 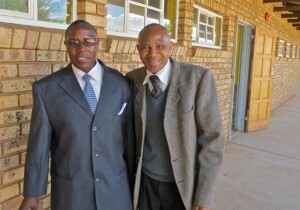 Elders Nonumwar and Arthur. 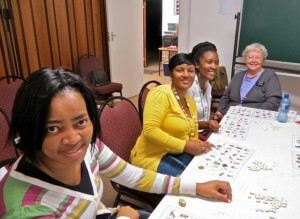 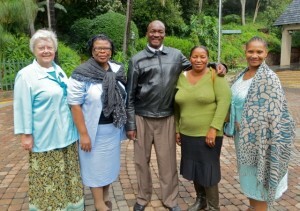 We also met the group from the Potchefstroom branch. 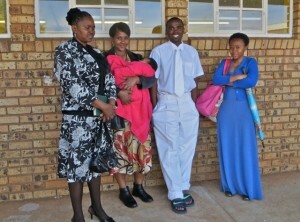 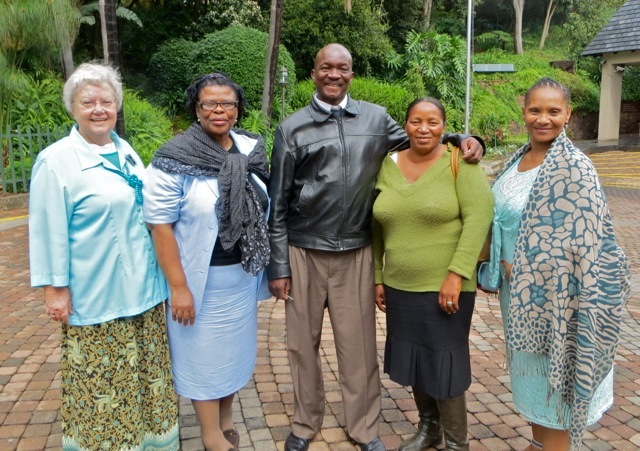 Mary is with sisters Williams, Mogapi, Thulo and brother David Rampai. 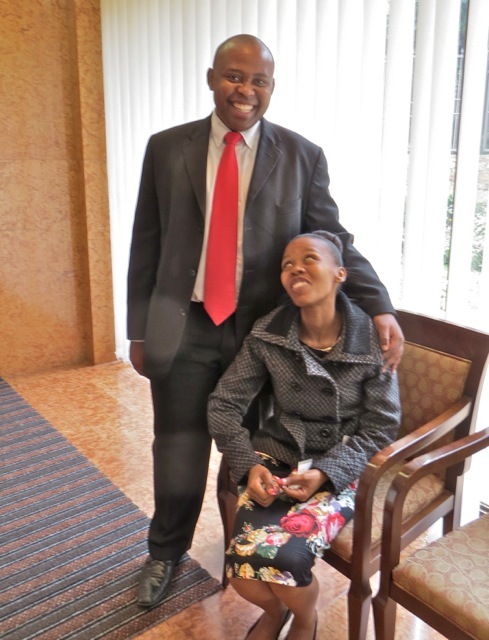 Another couple looking forward to being married in the temple – Bryan and Meise. 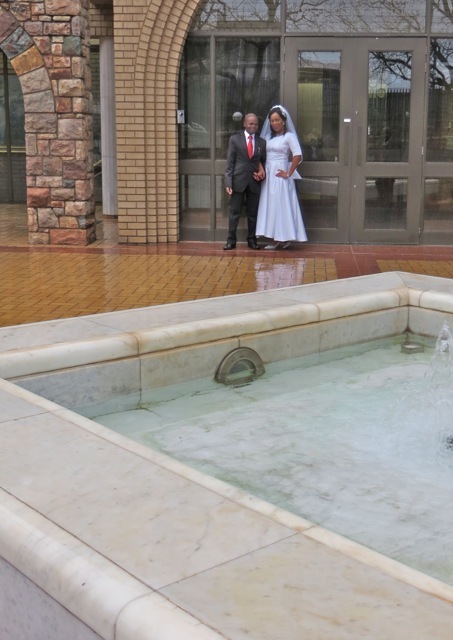 The Johannesburg temple celebrates the 30th anniversary this year. No one told me that it was red tie day…Bryan and president Kwaikwai got the message. 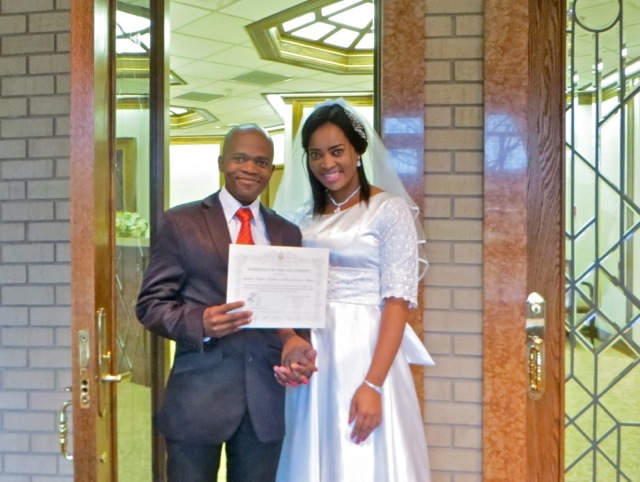 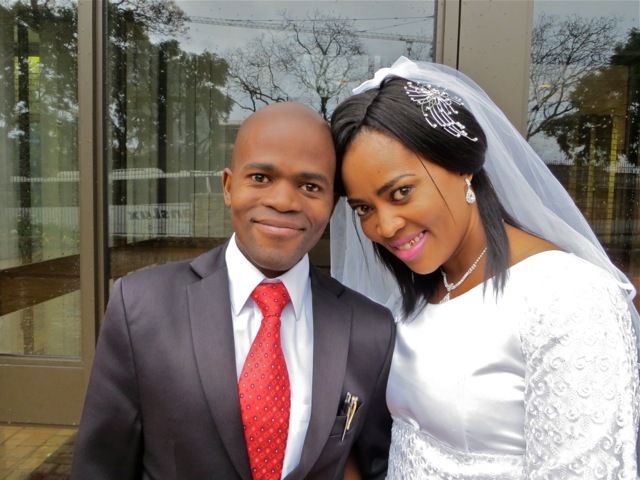 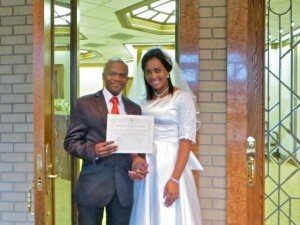 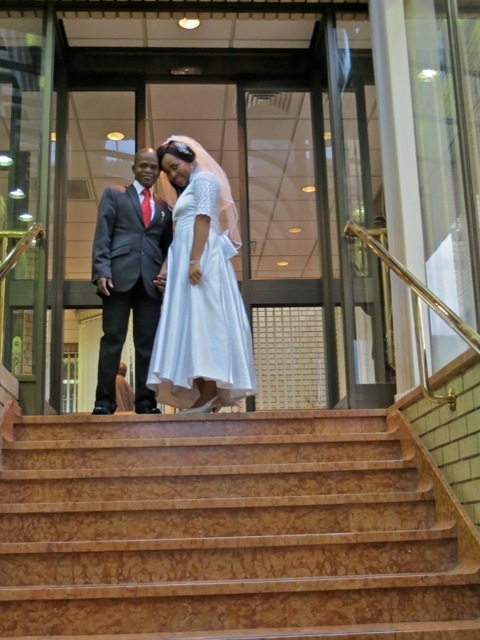 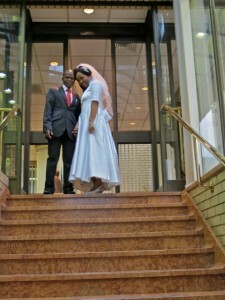 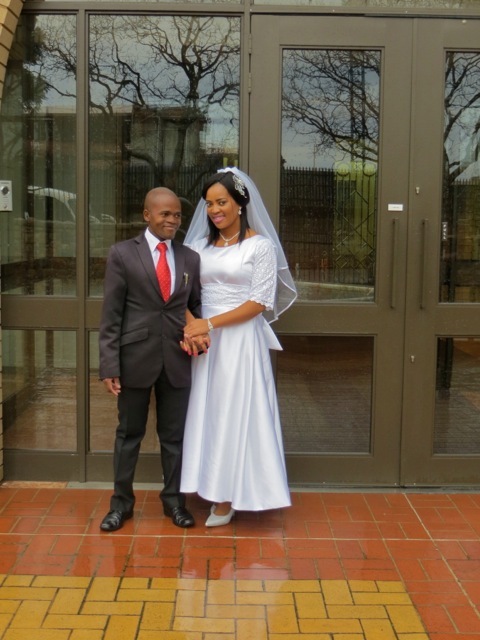 It is official – the new Mr and Mrs Kwaikwai. 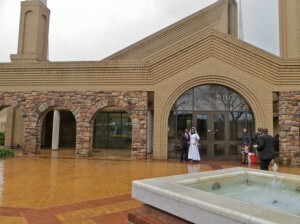 After the sealing we went to a local chapel for the reception. 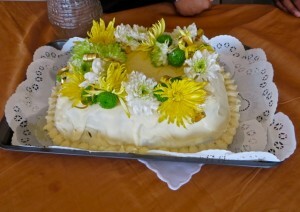 Our dear friend sister Taylor was kind enough to make a delicious and beautiful cake for the occasion. 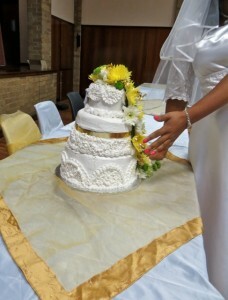 The top layer was a to kill for banana, the middle layer was strawberry, the bottom layer was chocolate with Oreos. She used real flowers to add to the beauty. This entry was posted in Johannesburg Mission - Back To Africa on April 25, 2015 by Bill. Tuesday we went to the mall so I could return something and Mary could do some shopping. 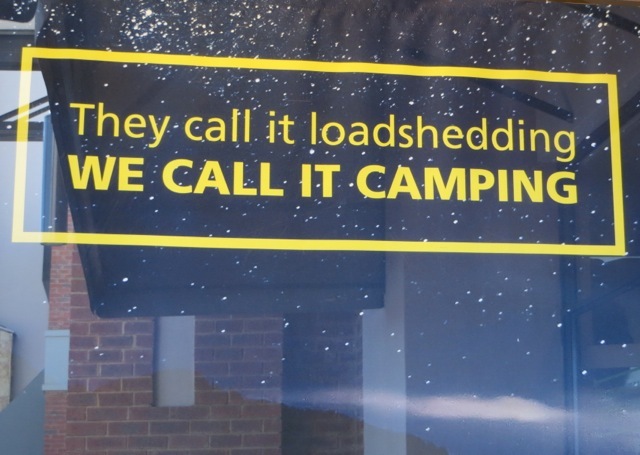 While we were there I saw this sign in the window of an outdoor store much like Out N Back. 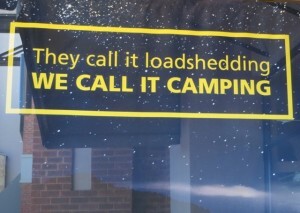 I have always thought that if you had the supplies and equipment to spend a week camping you were certainly prepared for anything that would require a 72 hour supply. We went to the school where Mary helped sisters Thulo and Williams to prepare to have their parents sealed in the temple. 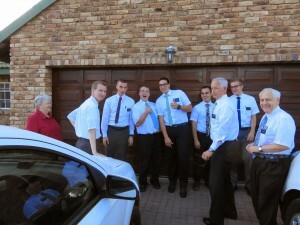 I took three pictures and in everyone sister Williams closed her eyes. 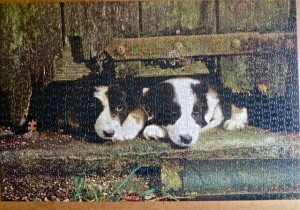 I was along to solve problems which I was happy to do the couple of times it was needed. 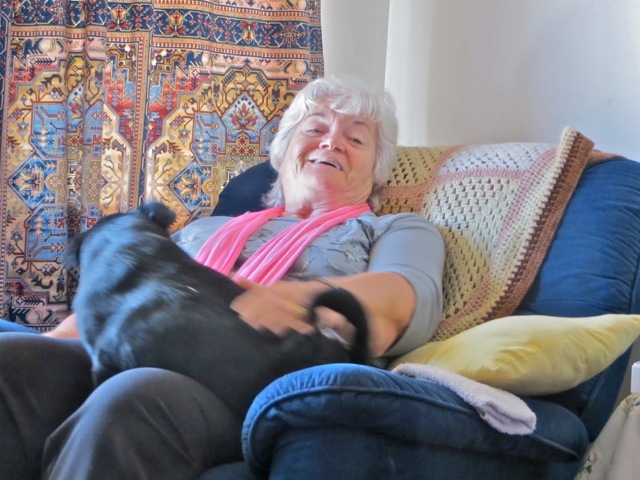 While Mary was busy with genealogy and later piano lessons, I visited a member. 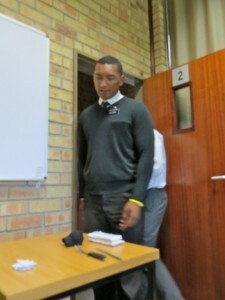 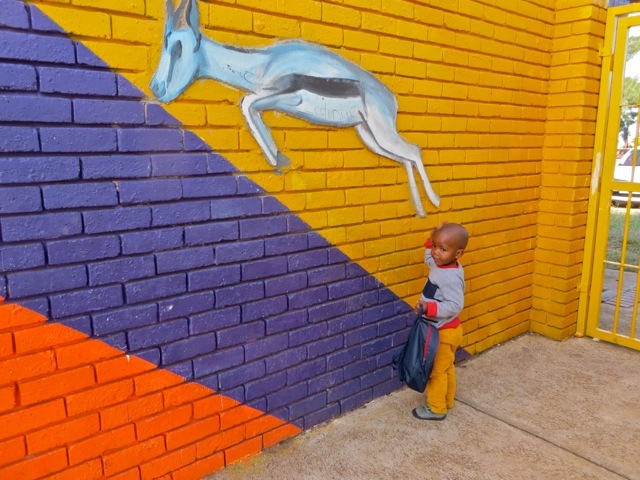 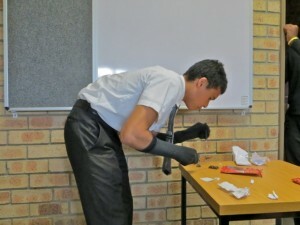 While on my way there I saw this young man patting the springbok mural on the school wall. Who can pass up taking a picture of such a cute child. 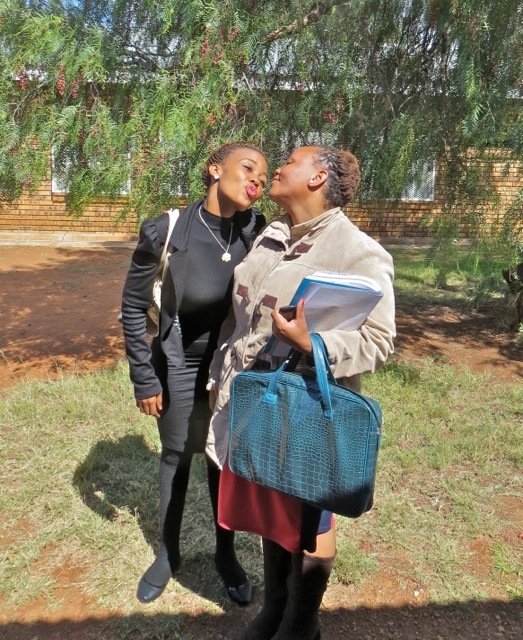 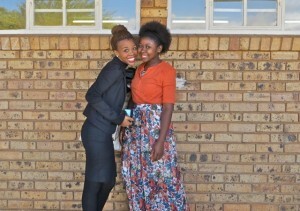 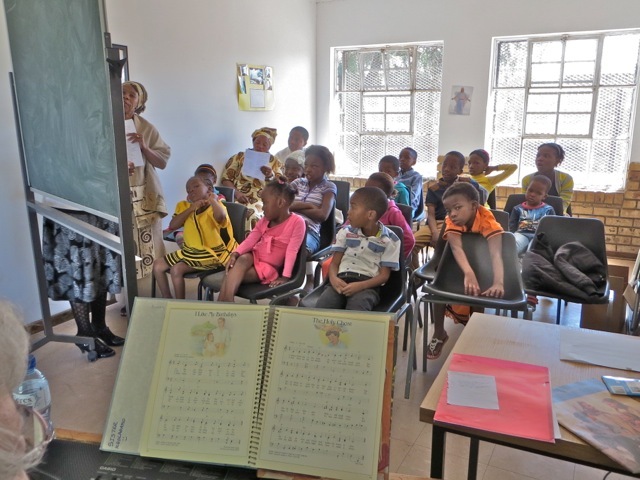 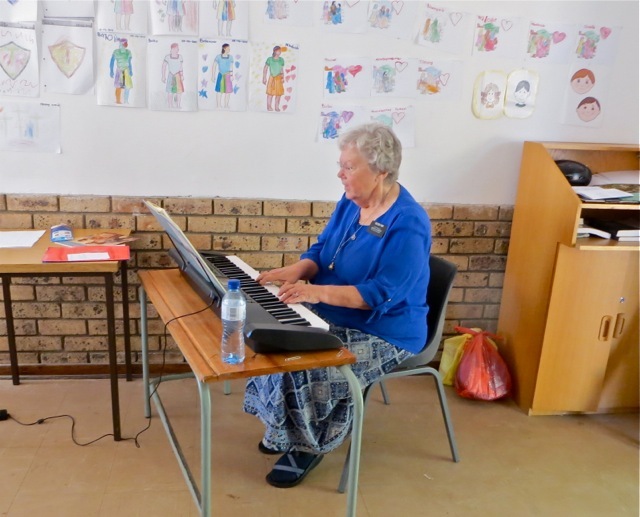 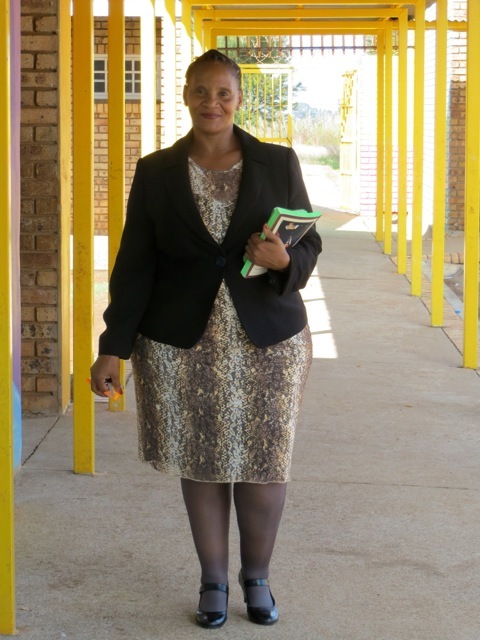 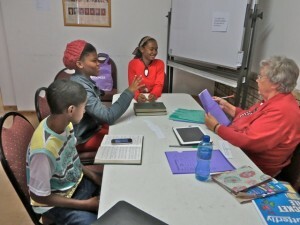 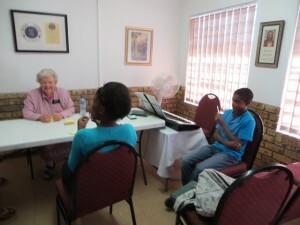 Sister Lebo is Mary’s most devoted student and is doing very well for only 5 weeks of lessons. 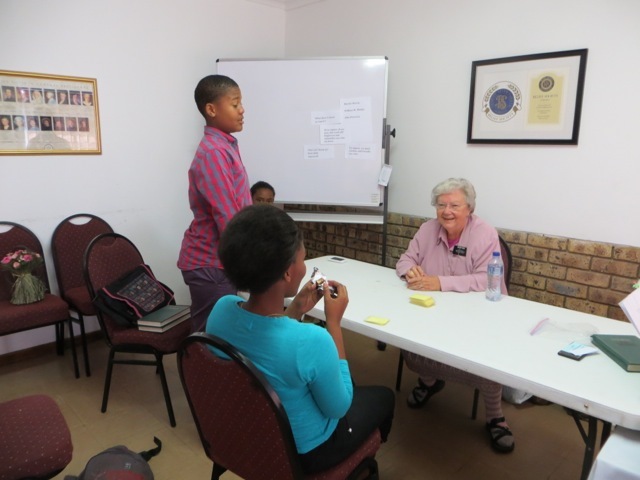 After the lesson we drove her home and found out that she had volunteered at game reserves in the area and knew the Faan Meintjes Reserve we went to yesterday. 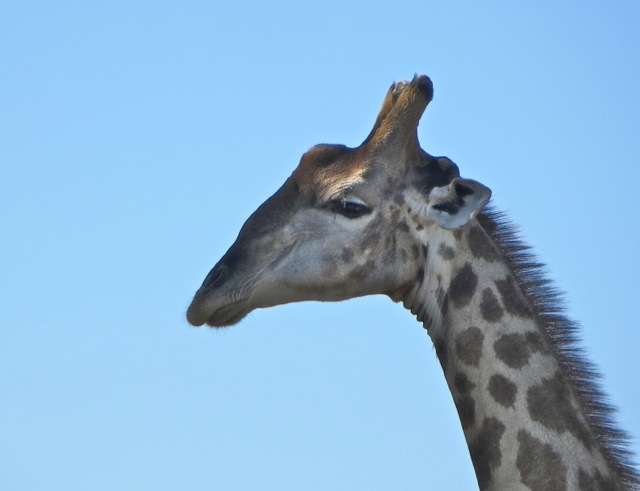 This entry was posted in Between on April 22, 2015 by Bill. We decided to spend the morning on a game drive at the nature reserve outside of Klerksdorp. 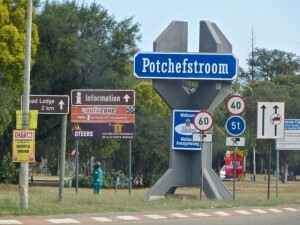 It was an adventure just getting there as we went the back way instead of going through Klerksdorp. Turning off the N12 we had nice road for about half the way and then we found ourselves on decent gravel roads. At least it prepared us for the unpaved roads we would find in the reserve. 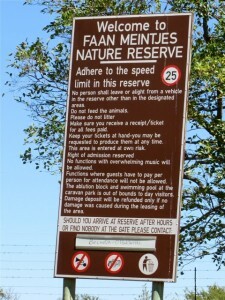 In the two drives we have taken at this reserve we have only seen one other vehicle that might have been on a drive. 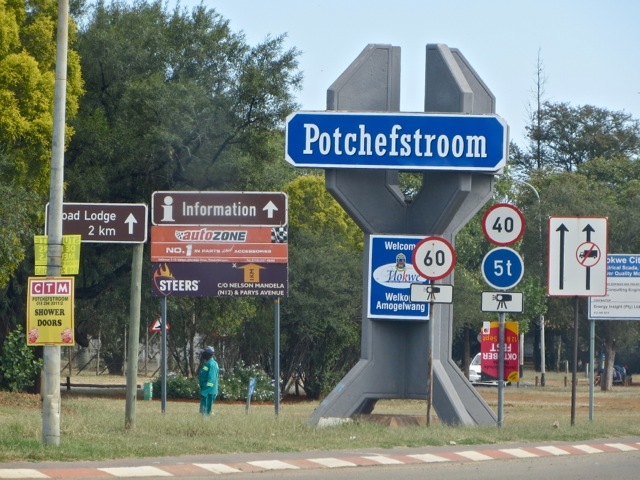 I do not think it is a very popular place to go – at least not during the week. They have cabins, an educational centre (England you know) and a really nice picnic area – none of which were occupied. 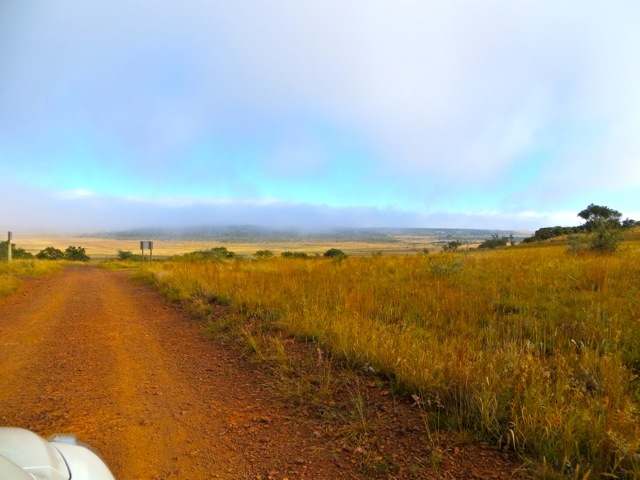 As we started our drive we got this wonderful view of valley below. It had been foggy on the way to the reserve but it was burning off an you can see the blue in the sky. 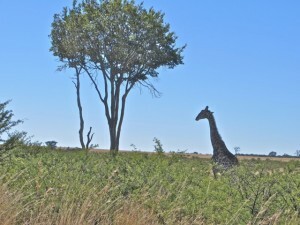 It was perfect weather for the drive – warm but not really hot. We were greeted by a good size herd of impalas. 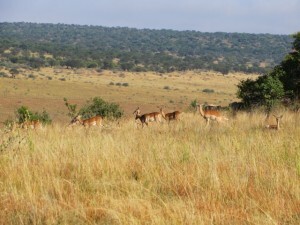 Later talking to the warden at the gate he was surprised that we saw this many impalas together because the week before he had taken 4 drives and only saw an occasional impala. 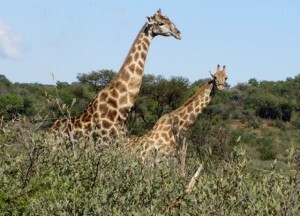 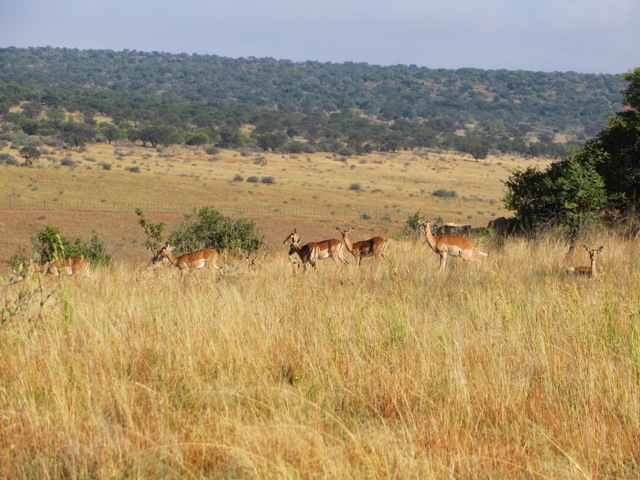 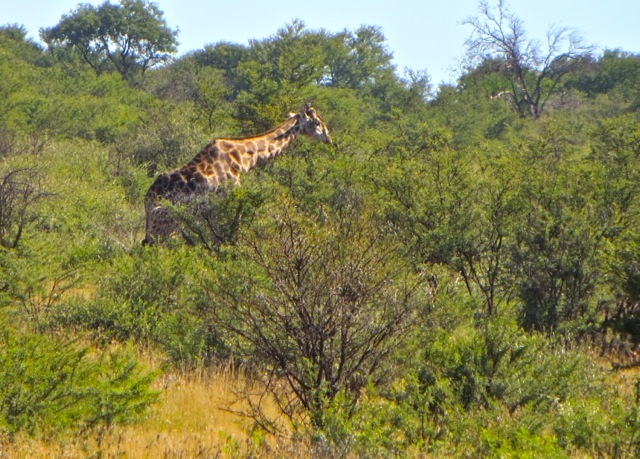 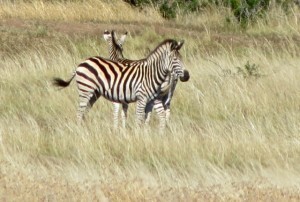 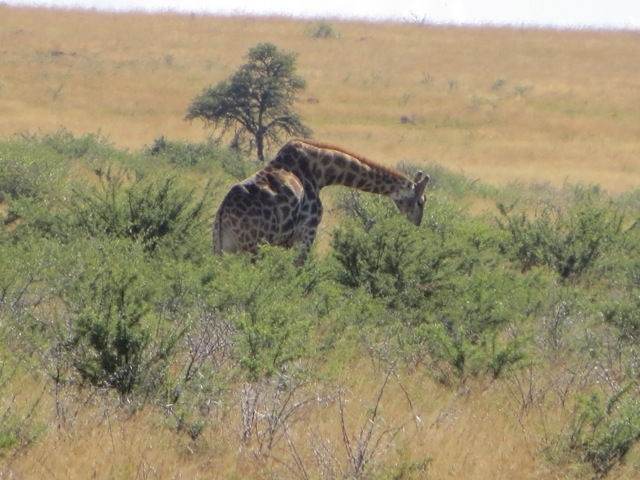 So it is with game drives – sometimes you see lots of animals an at others they seem to be all hiding. 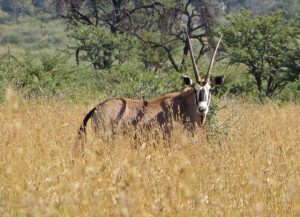 We saw lots of gemsbok but this big fellow was all alone and gave us a good looking over as we drove by. 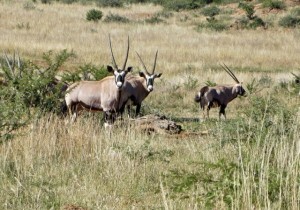 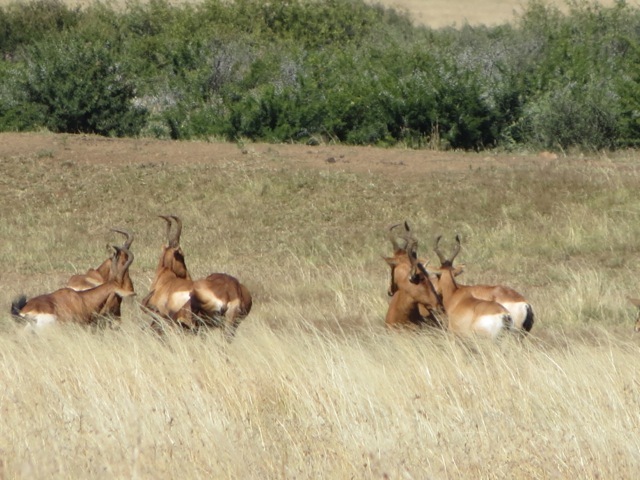 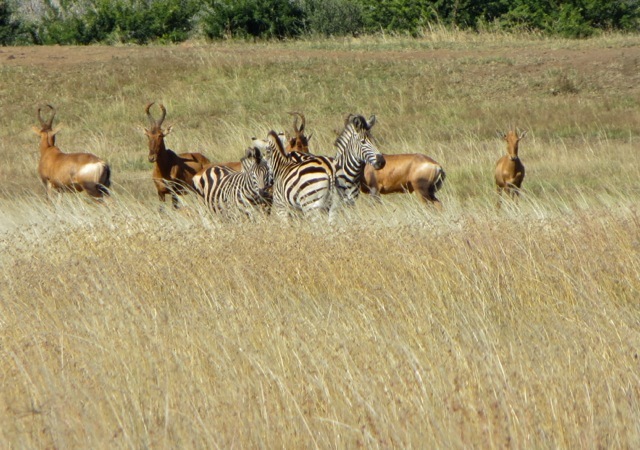 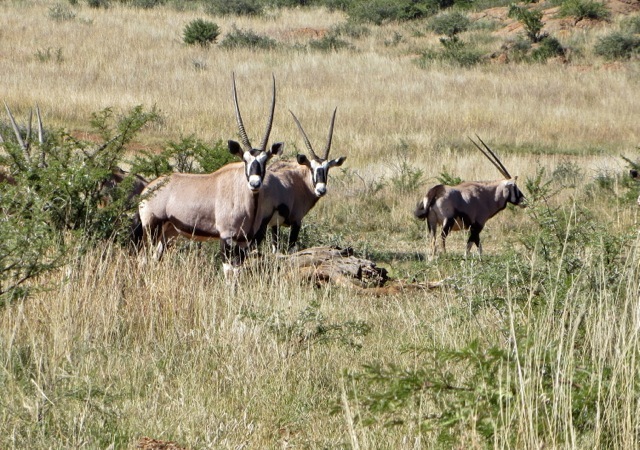 Zebras are alway fun to find – we did not see any by themselves but these three were among a herd of Hartebeest. I do not remember seeing any hartebeest on our last drive. 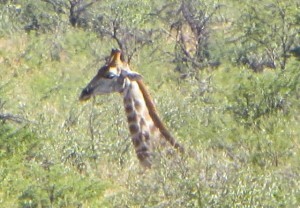 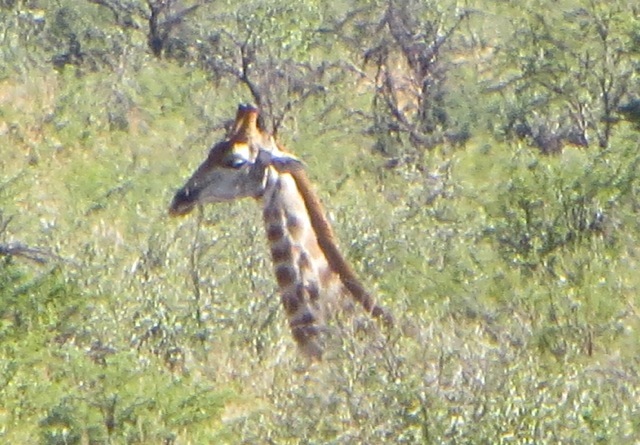 We finally found the giraffes.There are 7 in the reserve and I think we saw 5 of them. 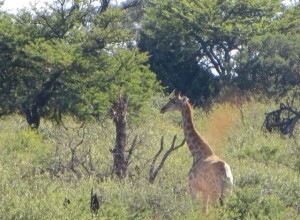 Most at a distance at first but then we found the road drove right next to them so we got a good look and pictures. 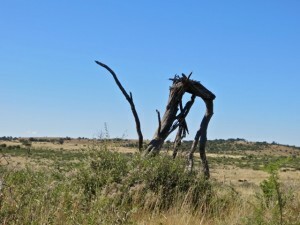 While taking pictures of some distant wildebeests, I noticed this interesting looking tree sculpture. 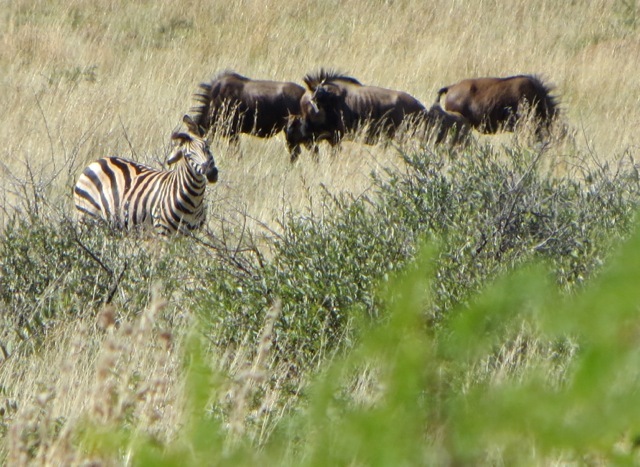 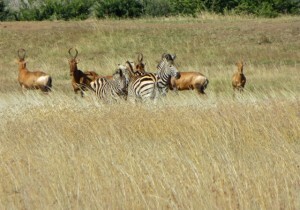 A herd of gemsbok and a zebra among some wildebeests. 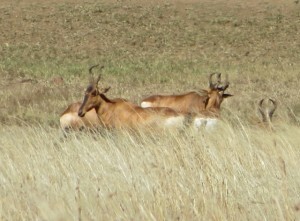 I never got a good shot of the wildebeests. 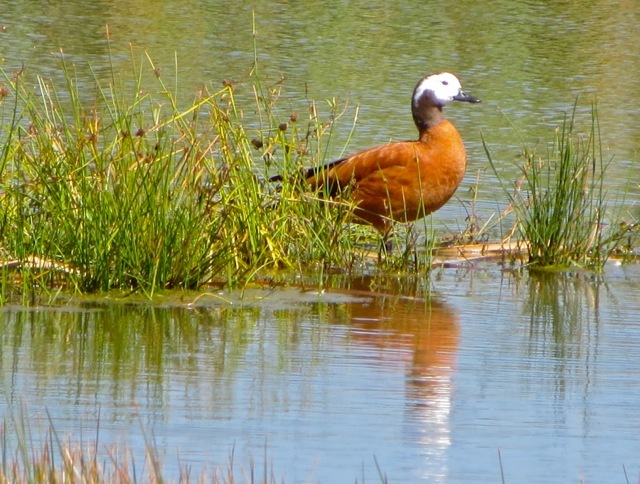 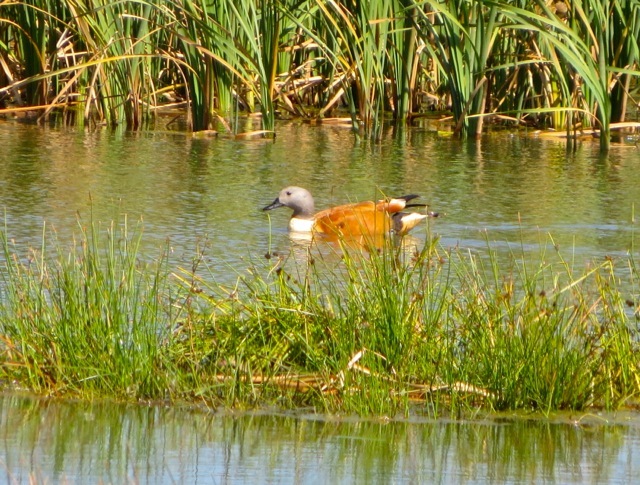 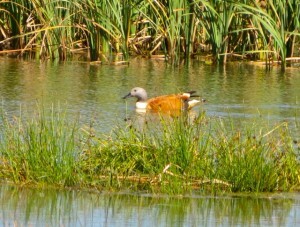 The male South African Shelduck was swimming while the female was just enjoying the sunshine. 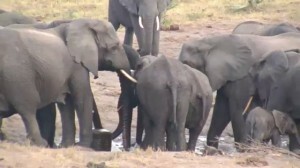 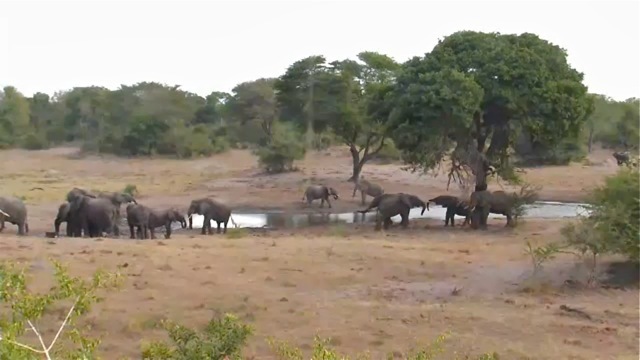 There are no elephants in the reserve but when we got home I went to the Tembe webcam and found this rather good size herd of them around the water hole. 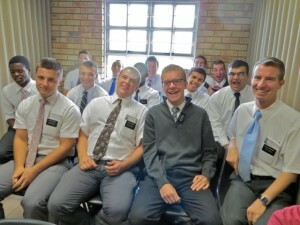 Notice the really young one in the lower right hand corner of the left hand picture. The herd contained all ages from large males to this little one…if some the size of a small car can be called little. 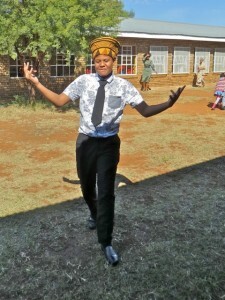 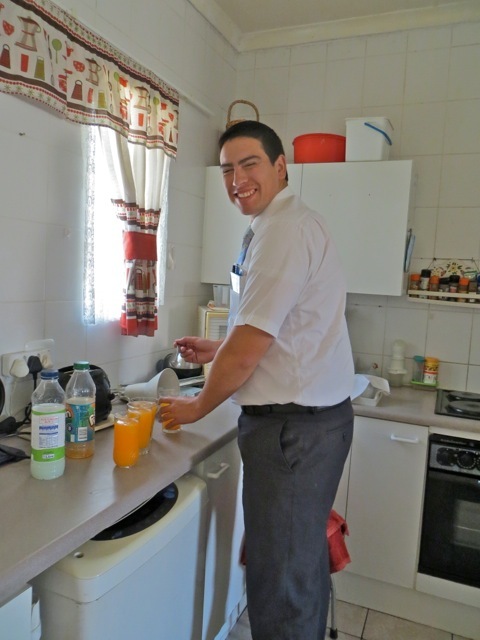 This entry was posted in Johannesburg Mission - Back To Africa on April 20, 2015 by Bill. 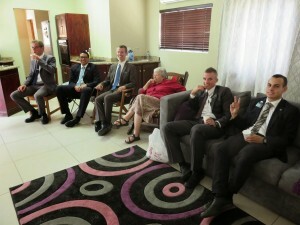 A couple of weeks ago President and sister Dunn came to our flat so the President could interview the Ikageng district. While they were here sister Dunn took these pictures and I borrowed them off her blog so we would have them. Mary, elders Peterson, Barton, Oldroyd, Alvial, DiRuscio, President Dunn, elder Todd and me after the missionaries and the Dunns had been out witnessing and having lunch at the Moori River Mall. While President Dunn interviewed the elders those who were waiting got to watch the Priesthood session of conference on Mary’s laptop. 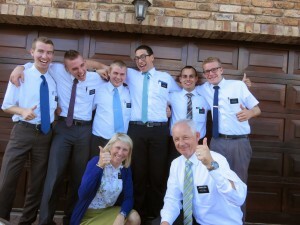 Elders Todd, Alvial, Peterson, Barton and DiRusico bookend Mary. 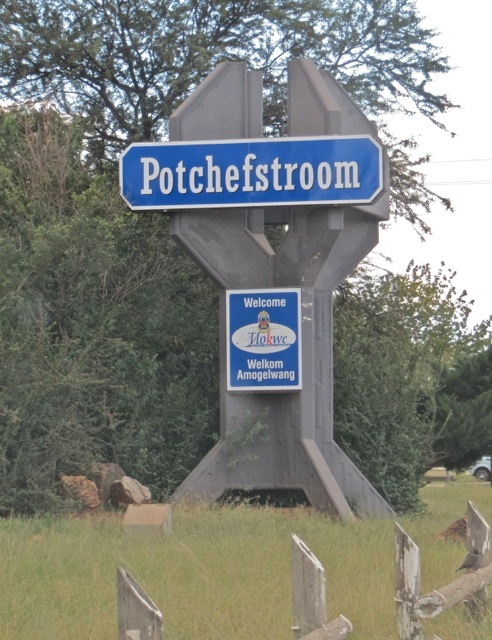 The other day I took a picture of the new welcome signs that have been put up on the concrete sculptures that have stood empty for the first year we were here. 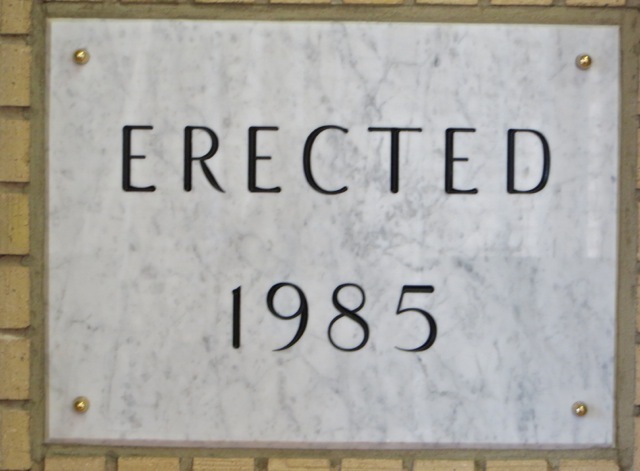 I took a picture of another one on last Friday but it was surrounded by lots of other signs. 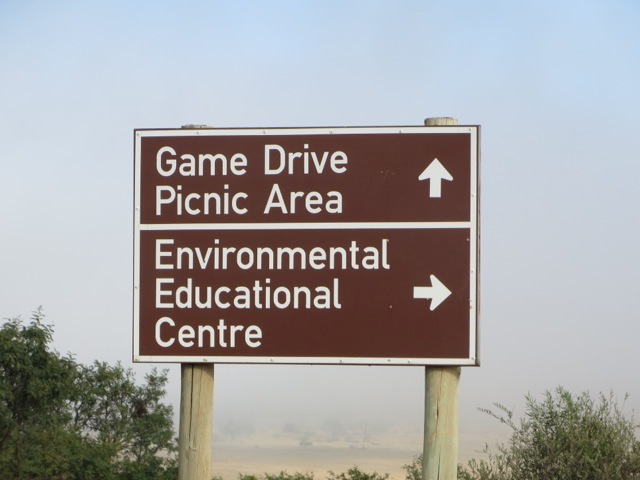 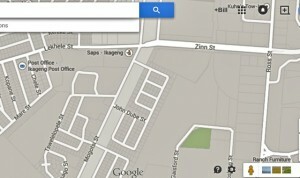 This on is right by where Ross comes into the N12 on the edge of Ikageng. 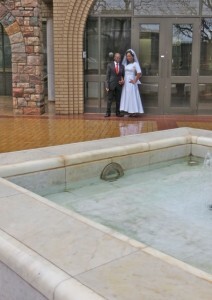 On Saturday the heavens really opened up and poured out rain. While we were stopped to get fuel I took this picture of the many splashes that can be seen as well as the people seeking shelter. 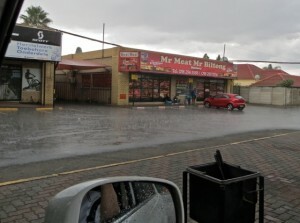 With winter coming the rain will soon almost stop – going from an average of 15 days a month in Autumn to 3 days a month in winter. Once again we were blessed with great weather as the clouds parted and the yard was filled with sunshine. 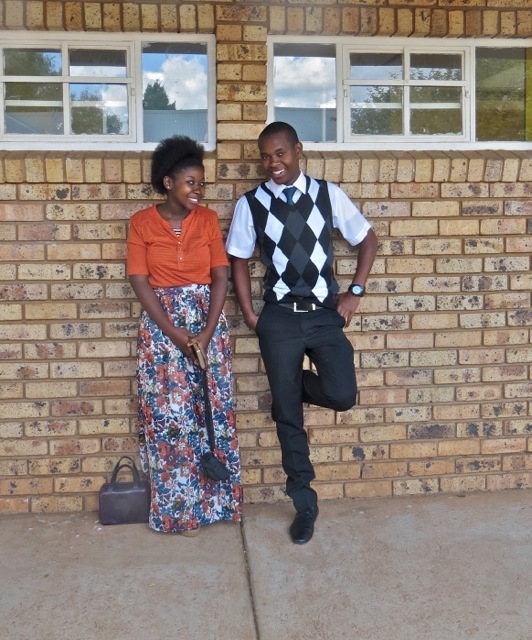 Before, between and after classes the members gather together to talk, take lots of pictures, and just enjoy the warm sun. 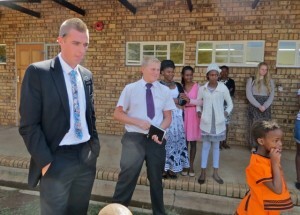 Sister Kujane with Adam Lebona and sister Molebogeng Ratema who has been called to serve in the Zambia mission. 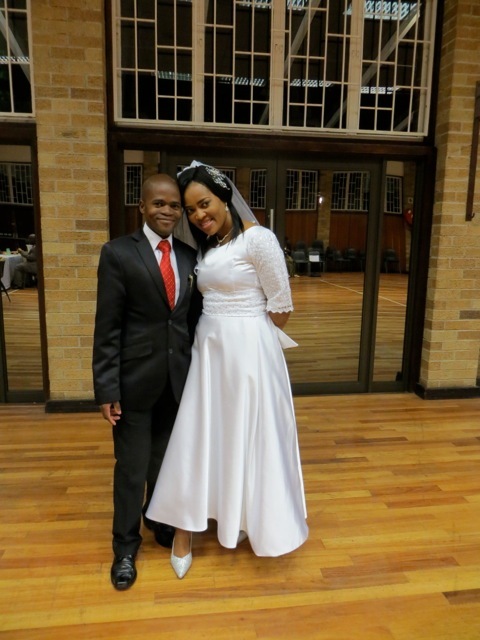 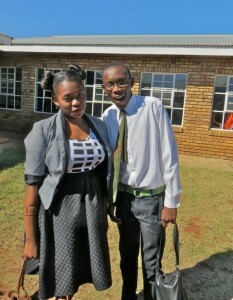 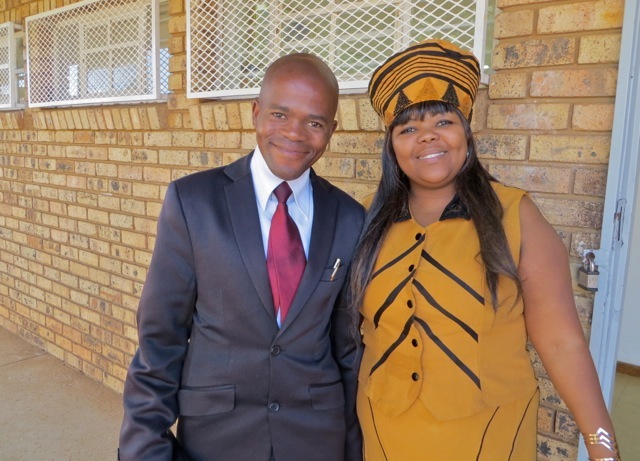 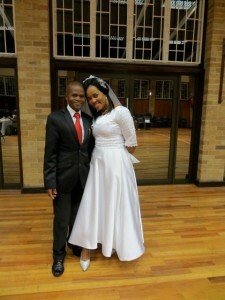 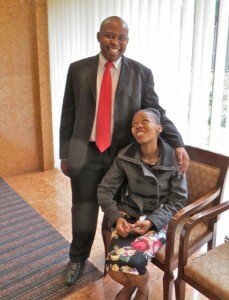 Menzi Ramosena with sister Kgolango (Meisi) Ratema. 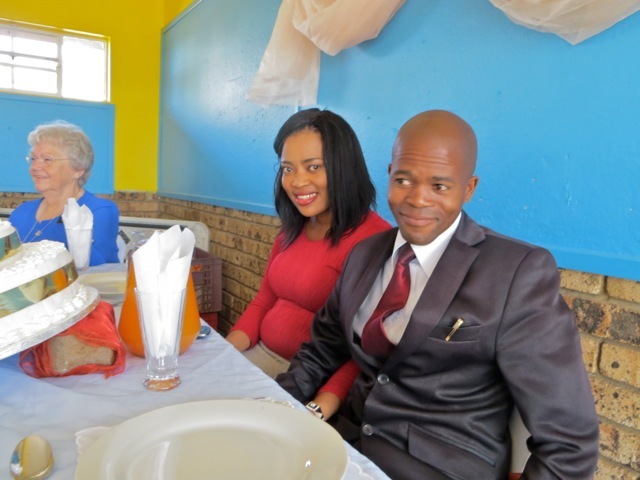 Everyone likes to pose for pictures…Jacque Kruger looks on as Papa Thulo and Renny Motha clown for their picture. 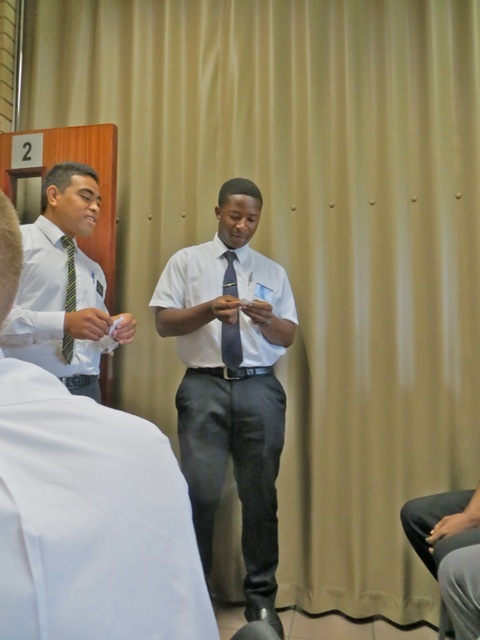 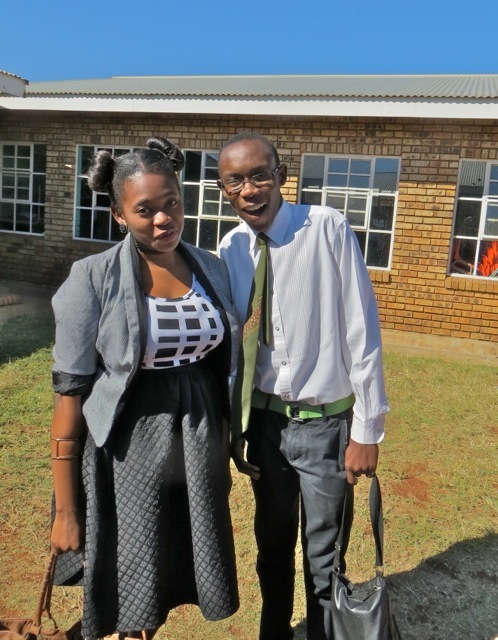 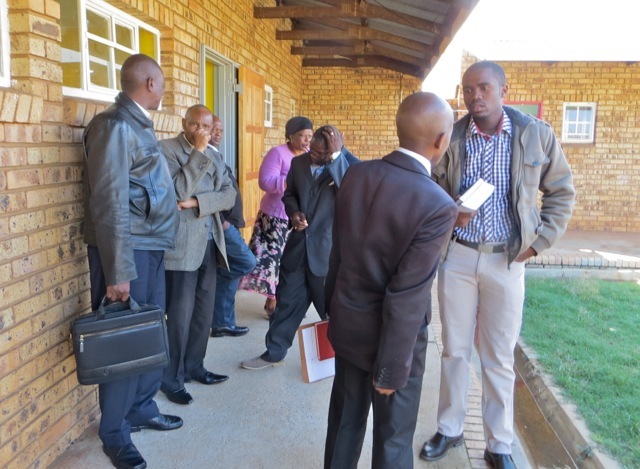 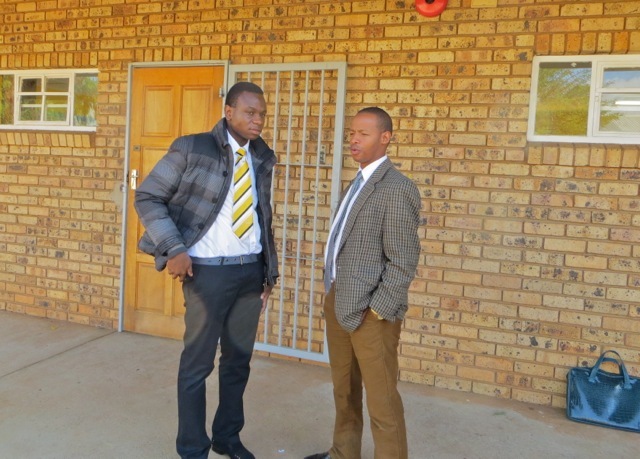 The elders quorum presidency – Tinashe and president Ncapayi – hold a casual meeting. 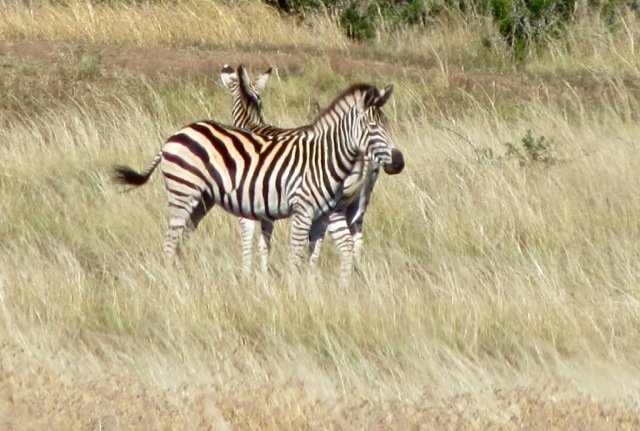 The two Ratema cousins pose for their picture. 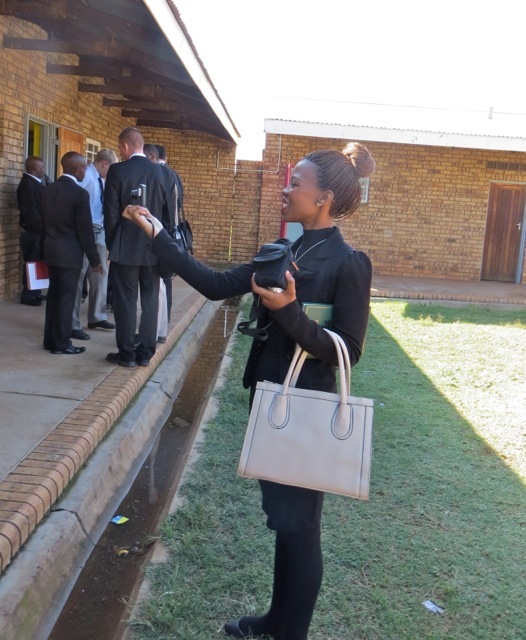 Meisi was busy taking lots of pictures while others are just enjoying talking. 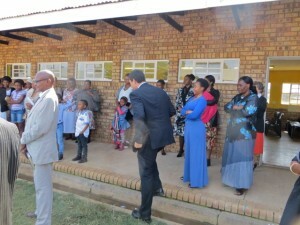 Brother David speaking with Simon on the left and president KK speaking to Gomoleno on the right. Gomoleno is scheduled to be baptized next Sunday. The two newest members of the branch – Joshua and Adrian Gerber share a picture with elders Avial and Barton. 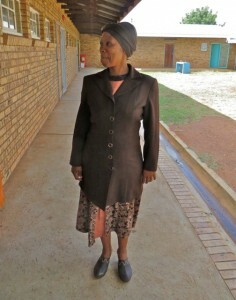 Sister Thulo stopped for me to take her picture. 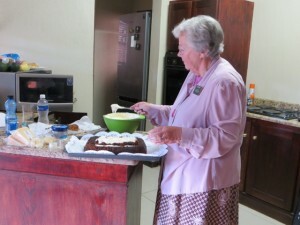 Sister Merriam was all in brown today. 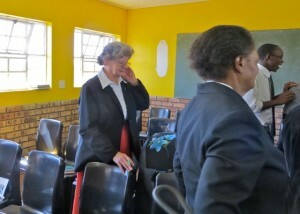 She is second counselor in the Primary presidency. 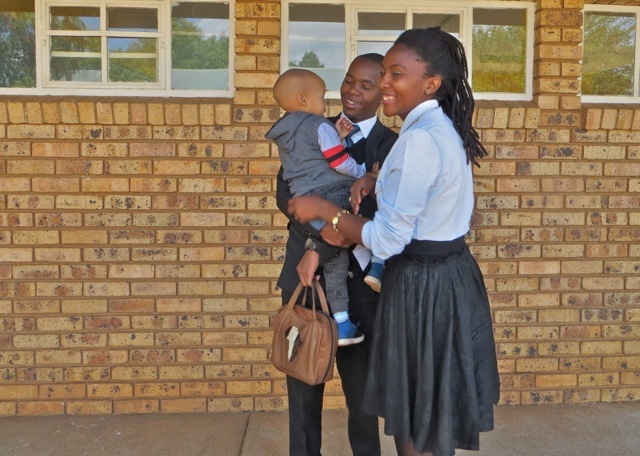 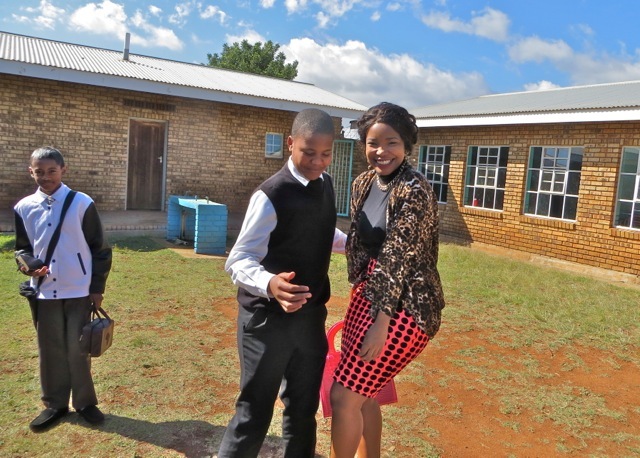 Omphile Mokate holds the Thulo young man while sister Lebo helps out. 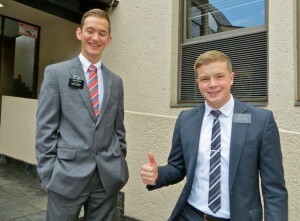 Brothers Johannes and Simon got together for this picture. 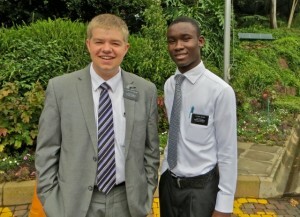 Brother Johannes is the branch mission leader and brother Simon is one of the branch missionaries. A group of YSA were gathered together so I took their picture. 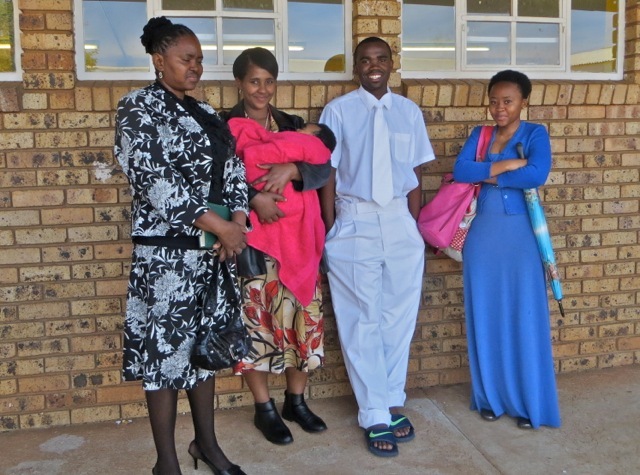 Sisters Amo, Ratema, Renny and Lebo are with brothers Omphile and Tinashe. 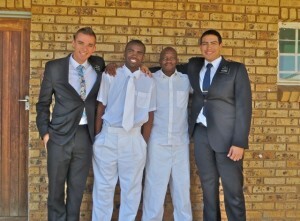 In the middle is brother Ncapayi who is not a YSA but looks right at home among them. 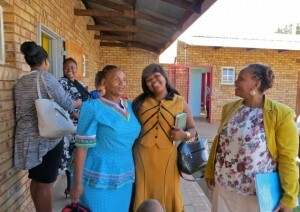 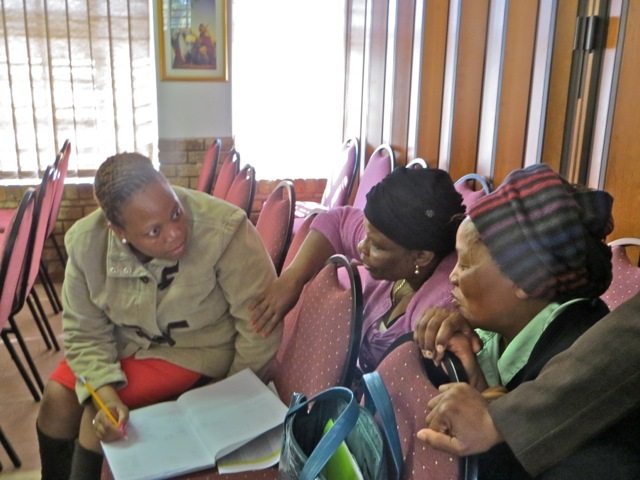 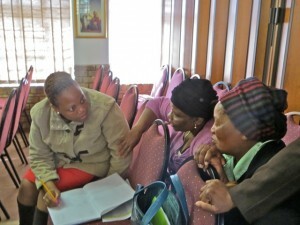 Sister Molebogeng Ratema and Omphile and sisters Kujane, Williams and Mogapi had a planning meeting. 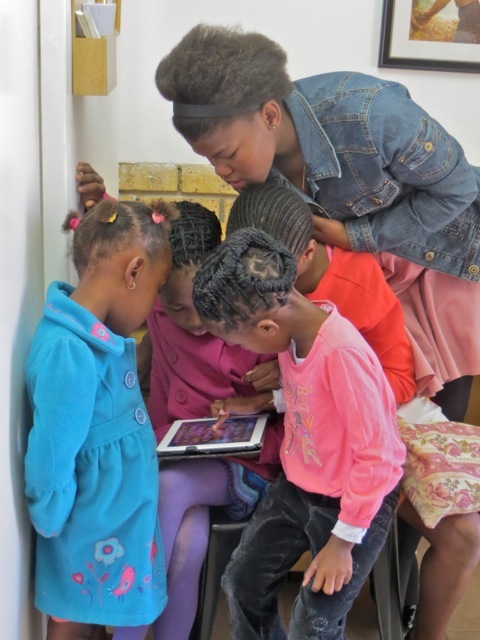 While their mothers were busy planning the Kujane and Williams children played with Mary’s iPad. 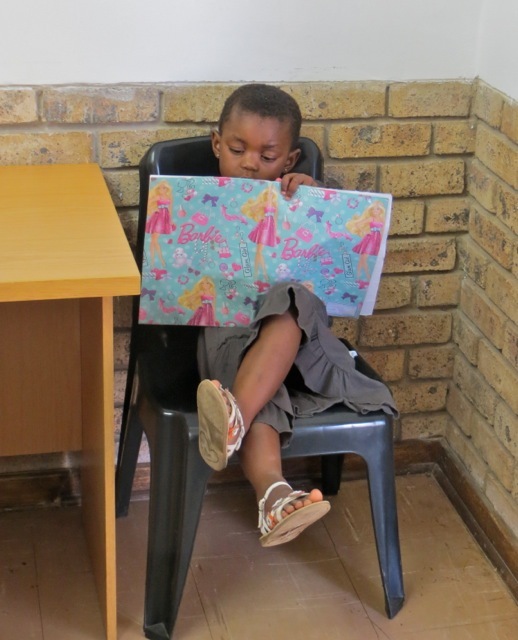 I was happy to see the youngest Williams granddaughter was more interested in reading her Barbie book than playing with electronics. 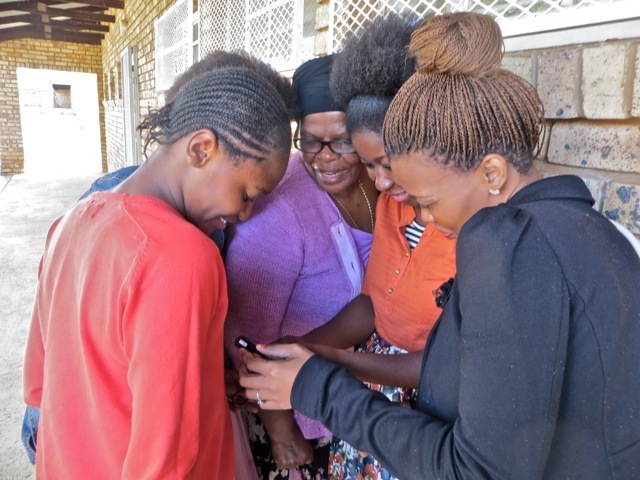 However the youth get it naturally as you can see here a group of women gather around to look at all the pictures sister Ratema took today. 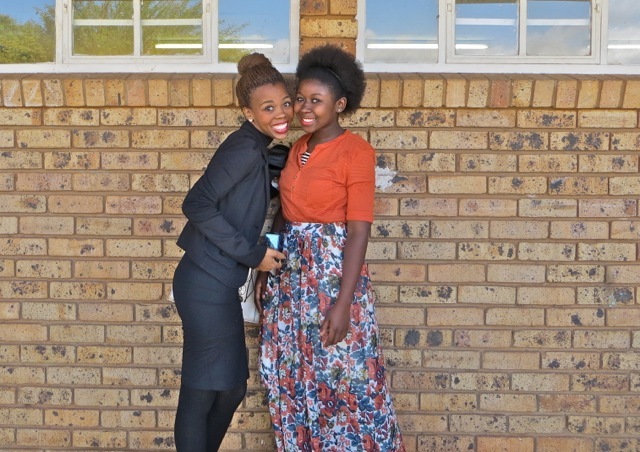 Sisters Ratema and Kujane pose in the sunshine for one last picture before heading home. 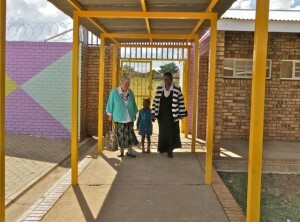 Mary starts for the car with another Sister Mary and her granddaughter. Sister Mary is a counselor in the Relief Society presidency. 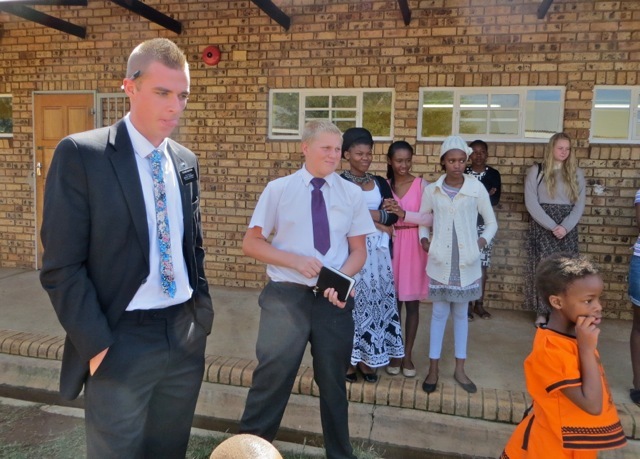 This entry was posted in Johannesburg Mission - Back To Africa on April 19, 2015 by Bill. Zone Development Meeting – Seminary – etc. 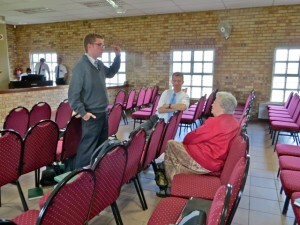 We could not remember if this Friday was Zone Development meeting or a regular District Meeting. 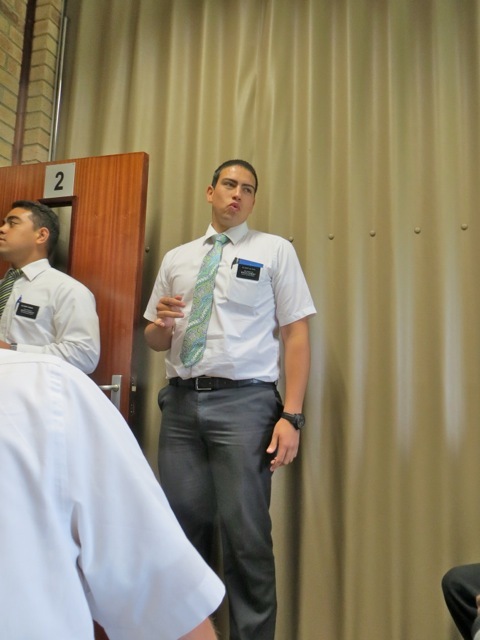 So I called our elders and they told us it was District Meeting. 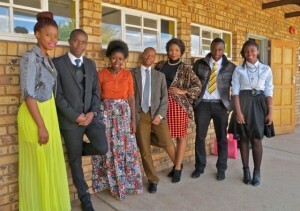 As we were on our way to Klerksdorp for the meeting we got an SMS from the ZLs saying the Zone meeting would be held in Sharpeville. 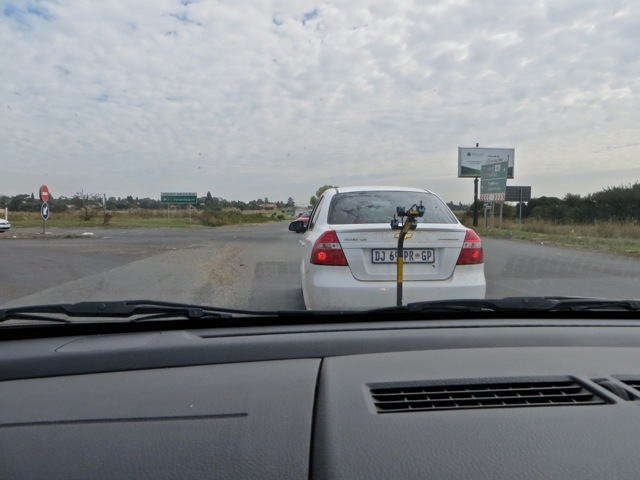 Luckily we were not too far down the road so we made a U-turn and headed for Sharpeville. 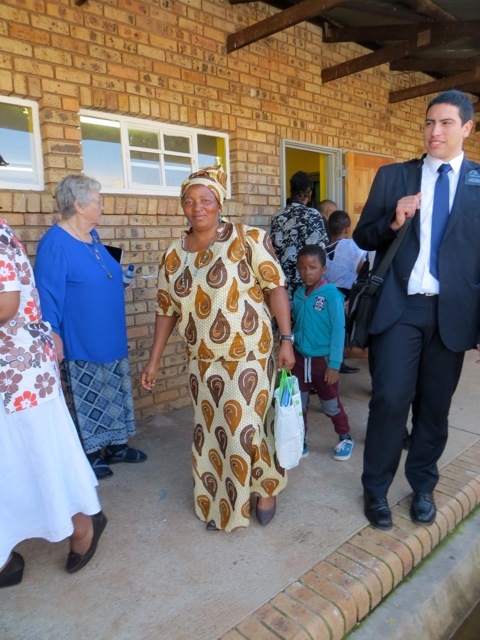 Along the way we caught up with the elders from Klerksdorp/Jouberton and followed them because we did not know where we were going. 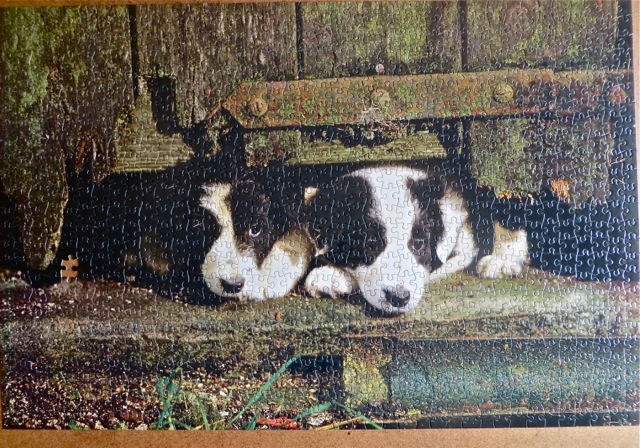 It turned out they did not either so we ended up taking a while longer than we should but everyone made it. The Elders in front of us. Elder Peterson directed the singing of the opening song. 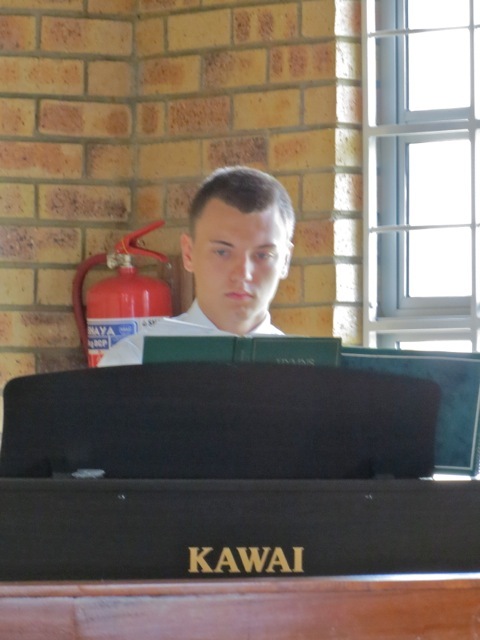 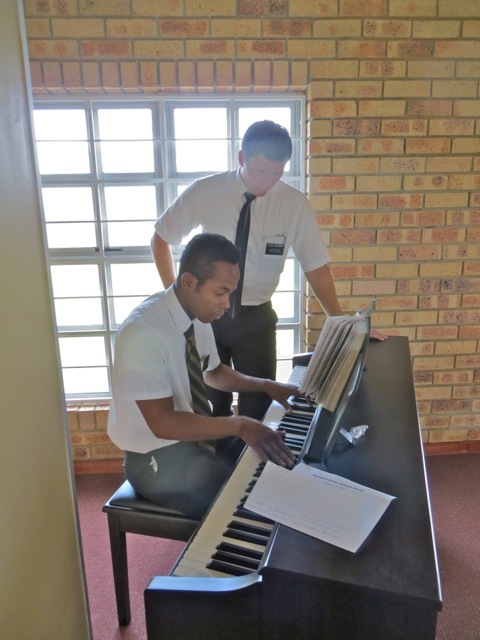 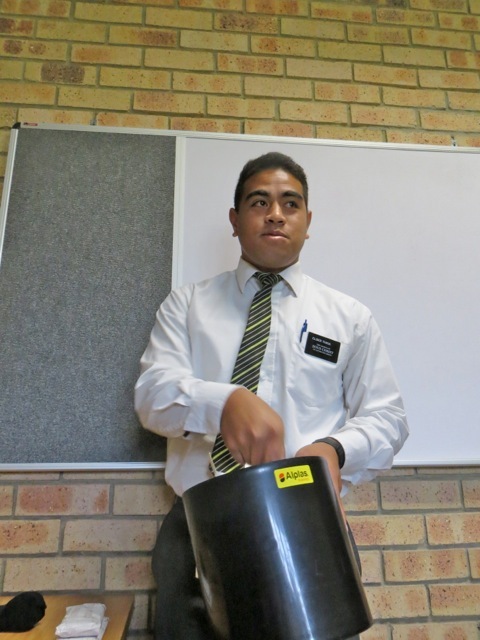 Elder Savage – trained by elder Clegg – played the piano. During a break Elder Todd talked to Mary while elder Peterson looks on. 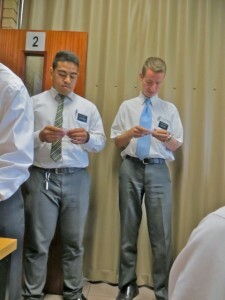 Elder Turouskis watches as elder Andritiana plays. 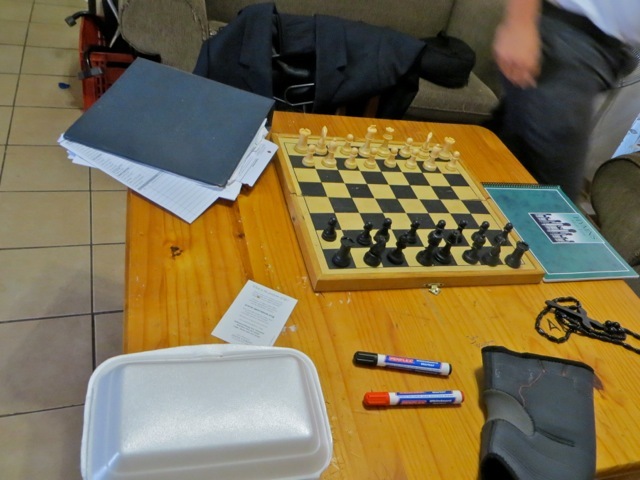 The ZLs had an activity planned. 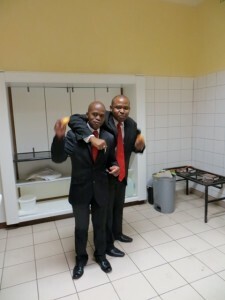 It is called 30 seconds but they did it with a twist. 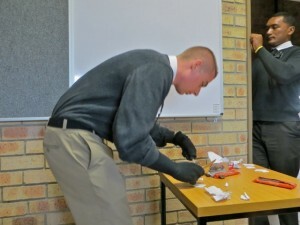 Instead of being a race against the clock they had two wrapped candy bars and while one team tried to guess the answer to the clues the other team had to unwrap the candy bar and them eat it with a knife and fork. To make it harder the one working on the candy bar had socks on their hands. Since the whole Zone was sitting down it allowed me to take a picture with most of them being seen. 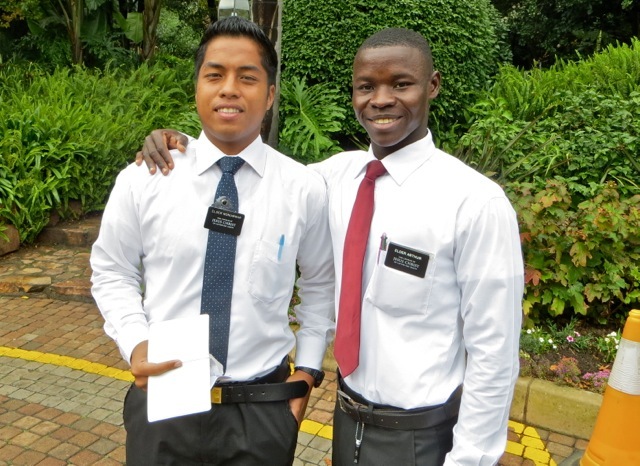 Our faithful ZLS – elders Tekurio and Togiatomai – or elders T2 and T1. Elder Oldroyd with his mouth full of chocolate. This was elder Andritiana last meeting with the zone as he is heading home a little early. 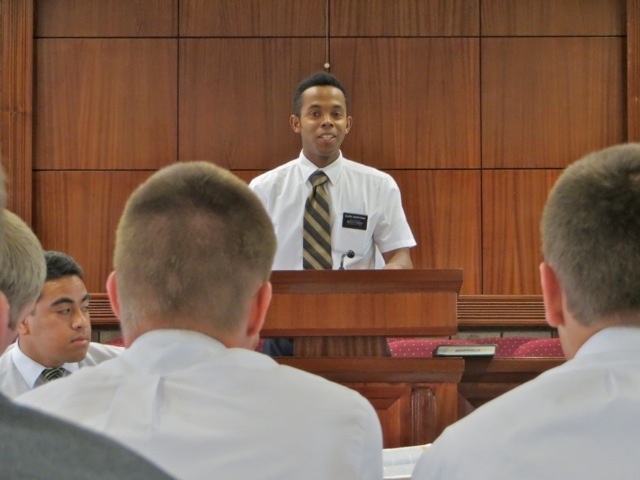 The ZLs asked him to bear his testimony. 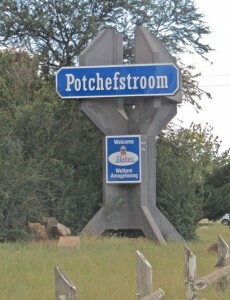 On the way home I took this picture of the new greeting signs that have gone up on the concrete sculptures at the edges of the city. 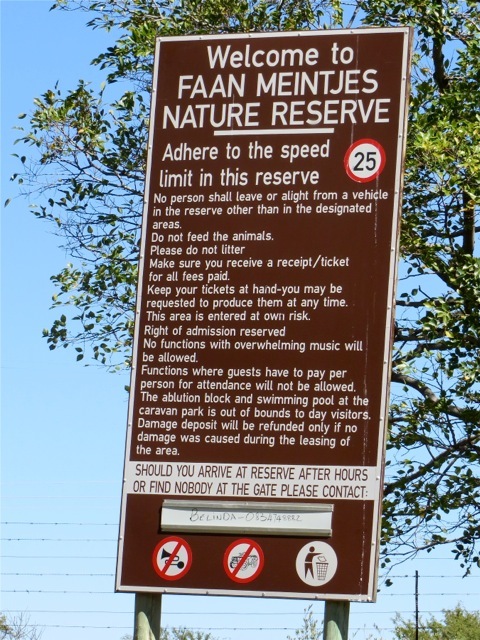 This one is surrounded by lots of other signs but a few days later I took one of another sign and it is in a post above. After a busy morning and driving 200 plus Ks we got home for 40 minutes before leaving for the office so Mary could teach Seminary and have an activity. 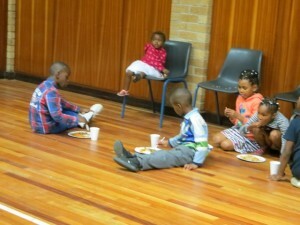 Unfortunately only three showed up but they had a good time learning, playing and eating. This entry was posted in Johannesburg Mission - Back To Africa on April 18, 2015 by Bill.